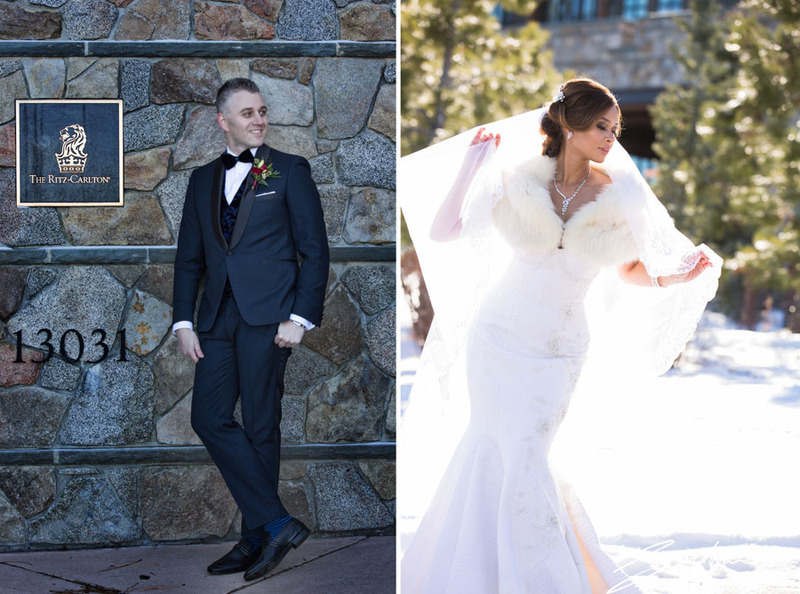 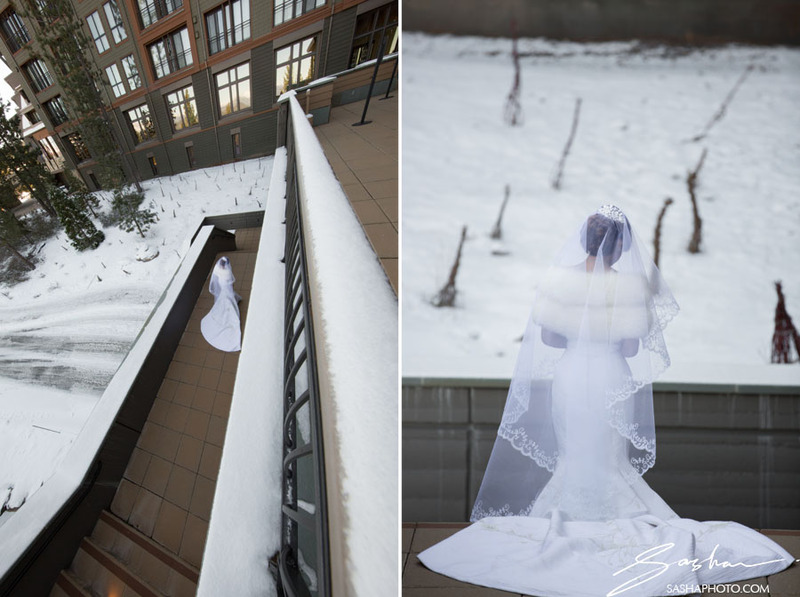 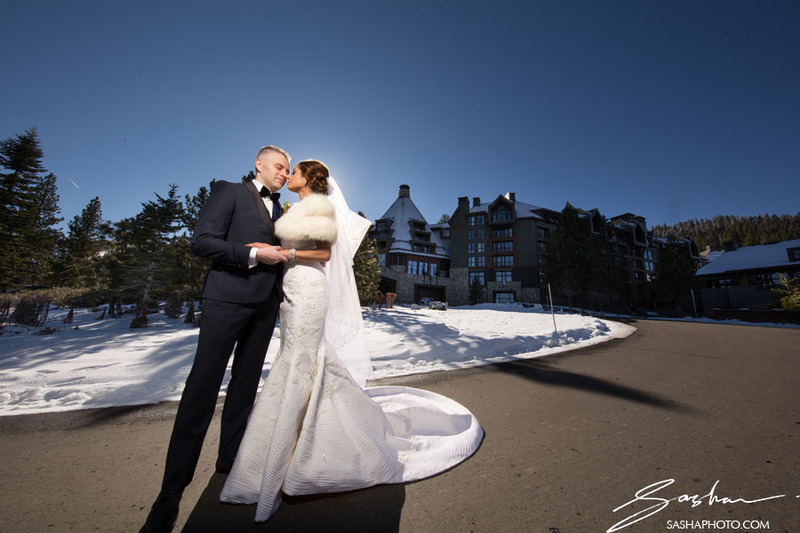 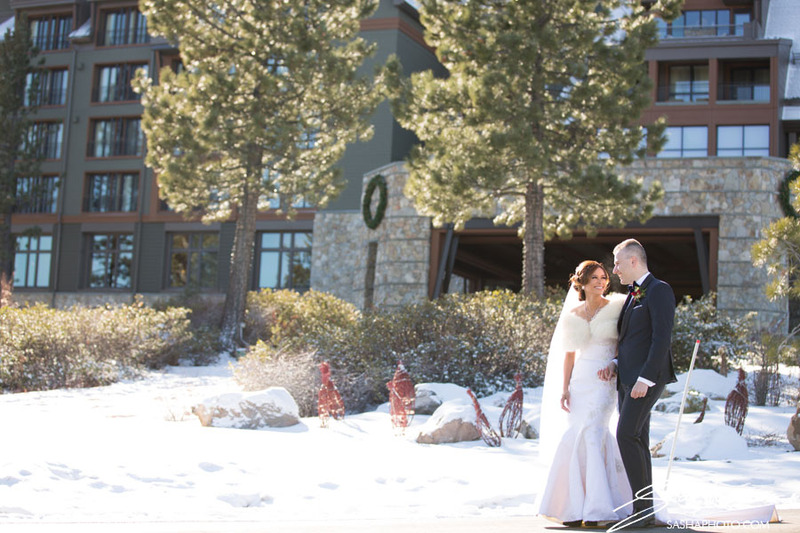 “Winter is Coming.” That was the working title for Dan and Michelle’s Ritz Carlton Lake Tahoe wedding. 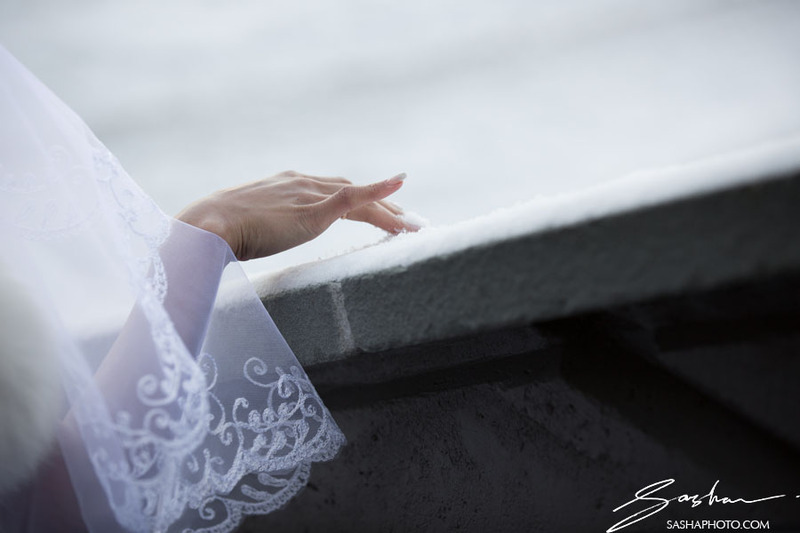 But if we rewind to the moment they met, it’s easy to see how a simple twist of fate might have kept “Winter” away forever. 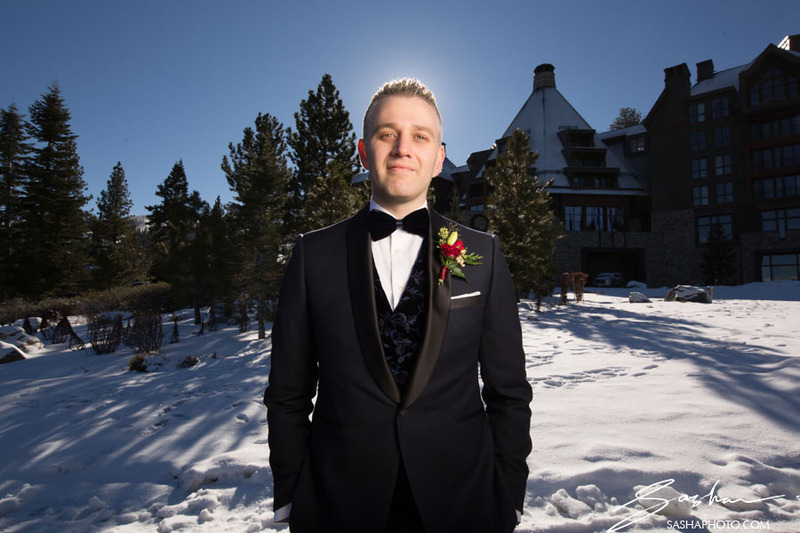 Dan was on a plane to SF, coming back from Vegas. 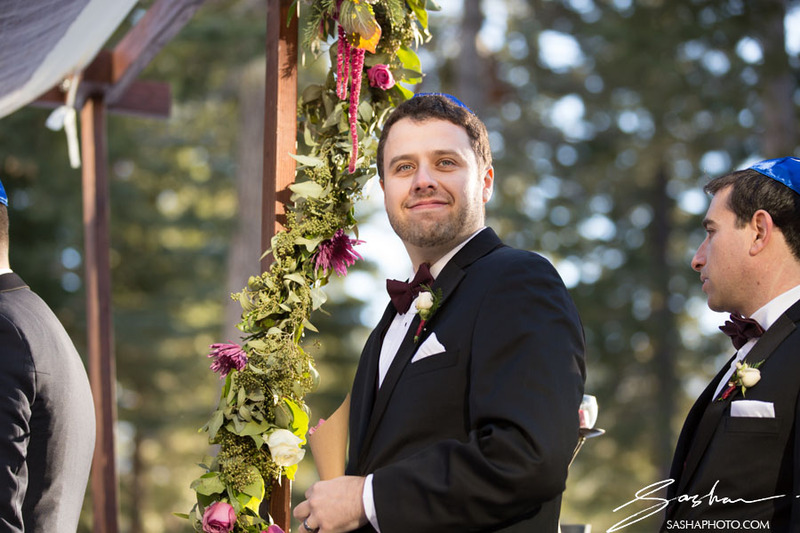 He was hung over, tired, and slightly disoriented. 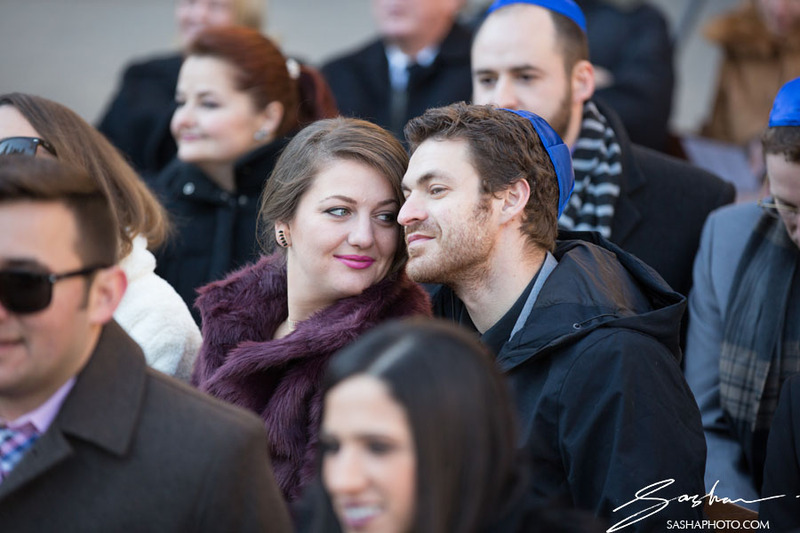 He tried to sit in someone else’s seat. 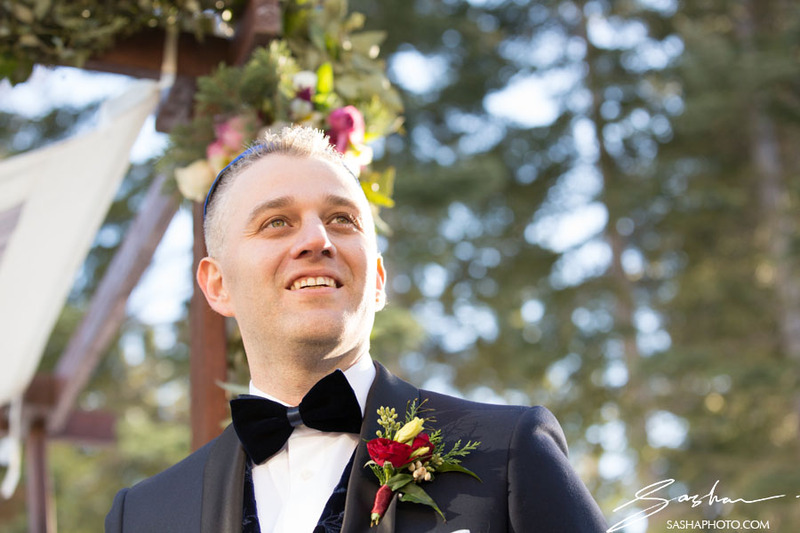 When he realized his error, he tried to negotiate for the seat anyway so he could sit next to his friend. 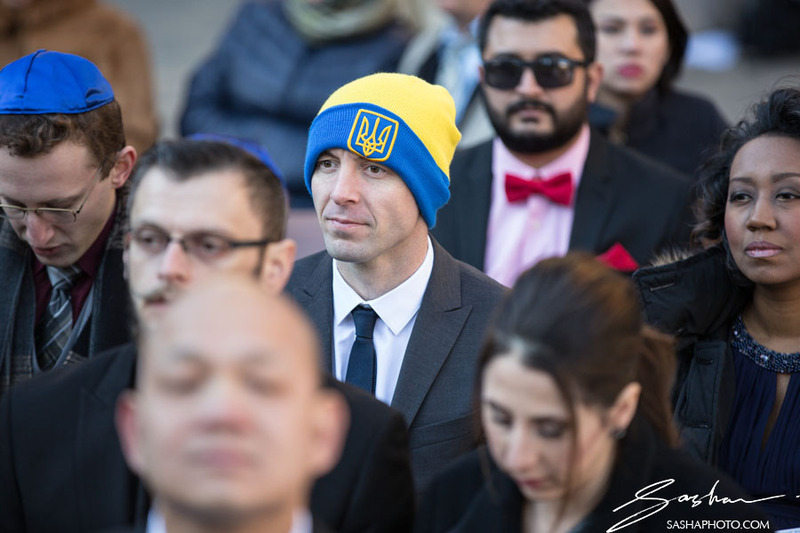 The legitimate seat-holder refused to trade. 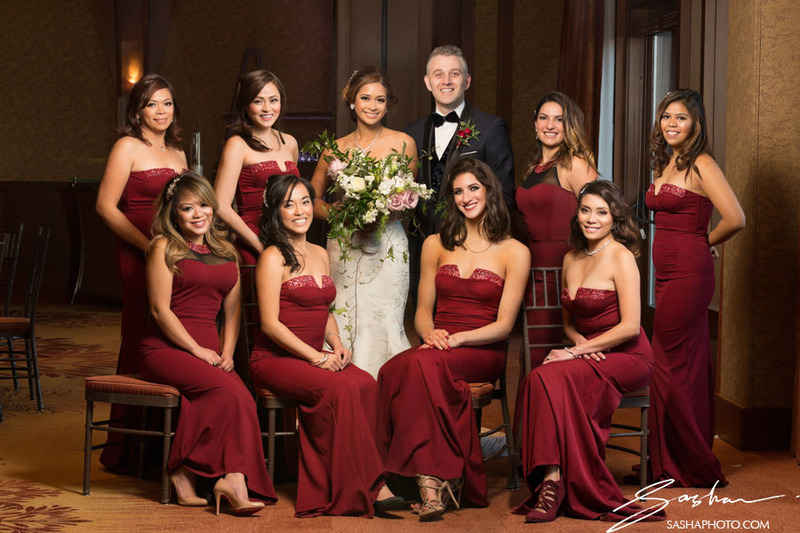 So Dan sat in his own seat, next to Michelle, and the rest is history. 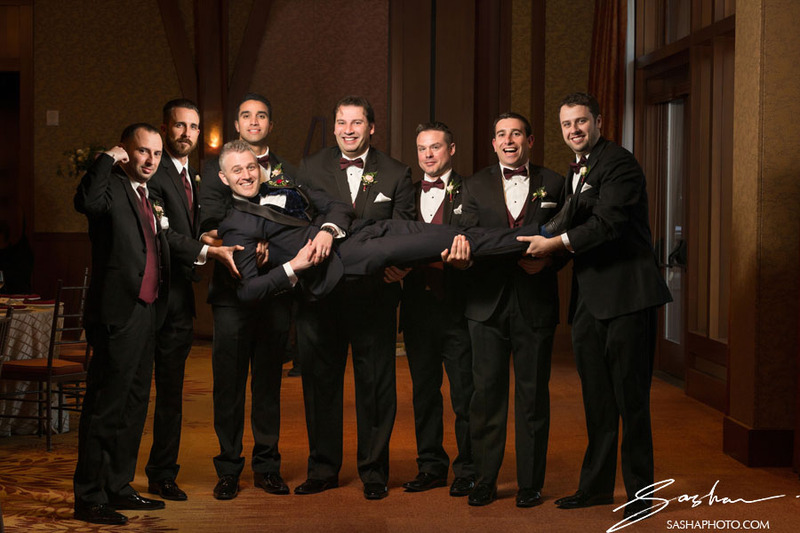 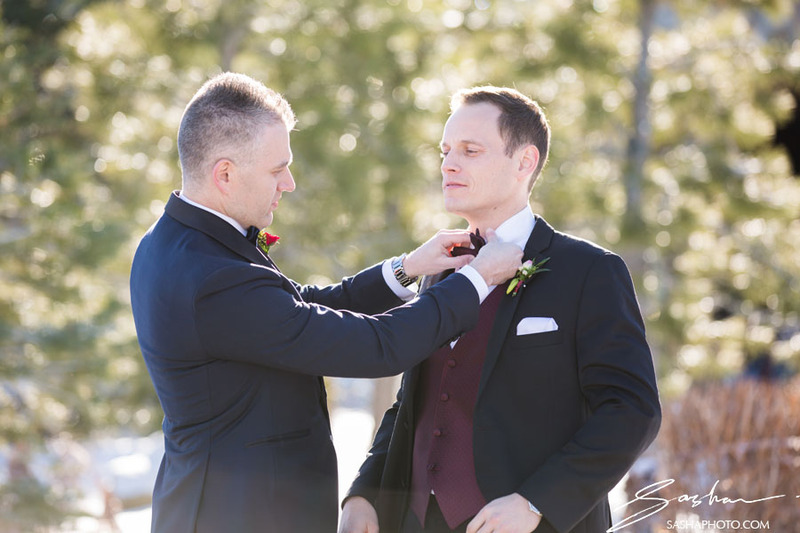 This was a very special wedding for me, because Dan is one of my oldest and closest friends. 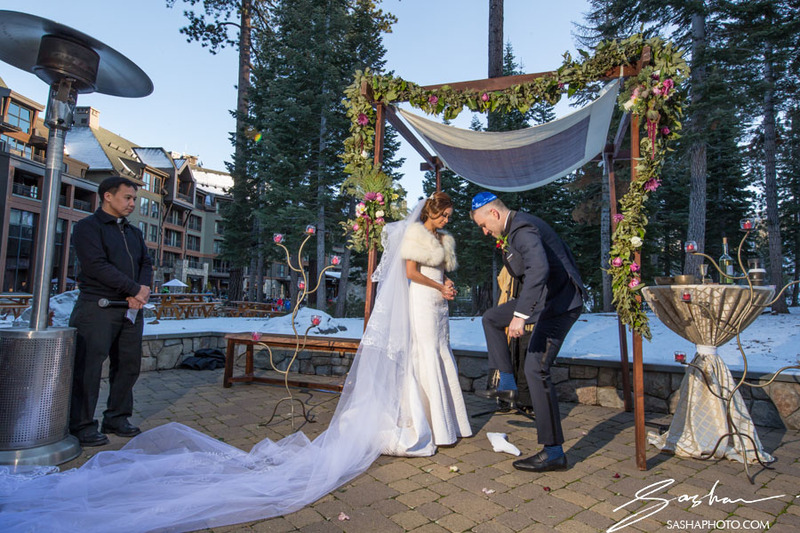 After he proposed to Michelle in Malibu last year, the plans for their winter wedding were hatched. 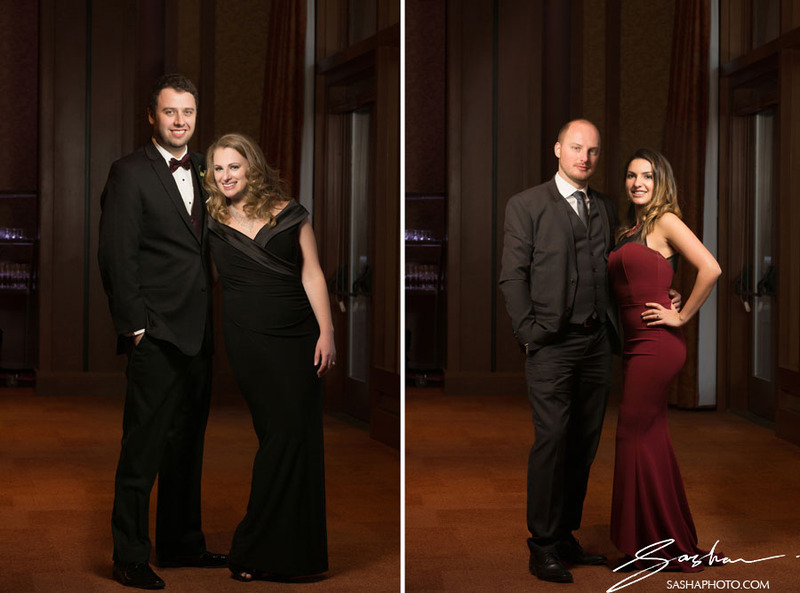 The couple decided to do a Baker Beach engagement session at sunset, because they wanted contrast with their winter plans. 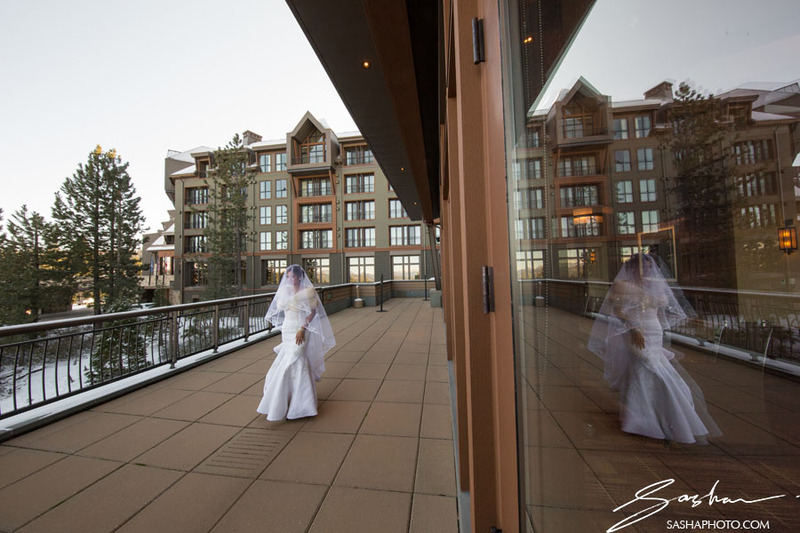 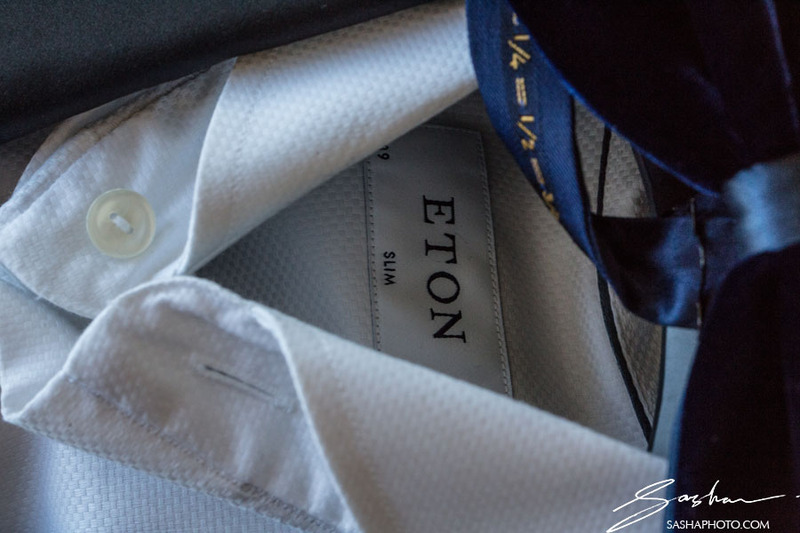 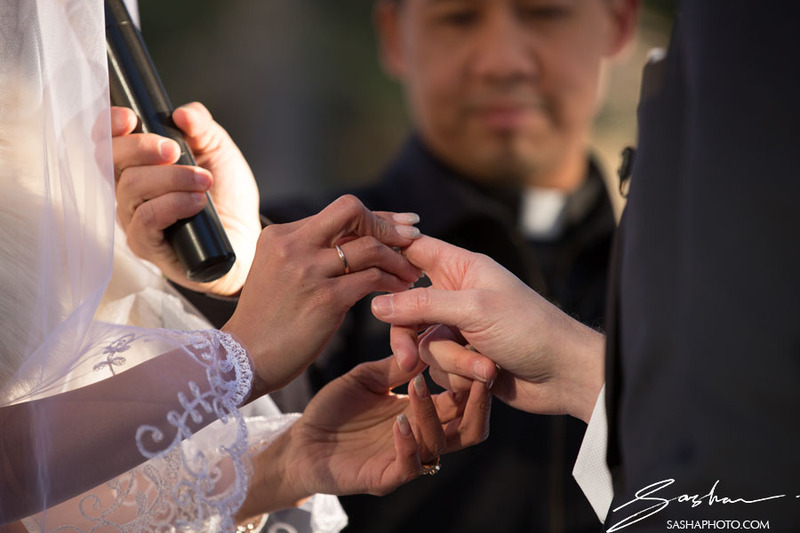 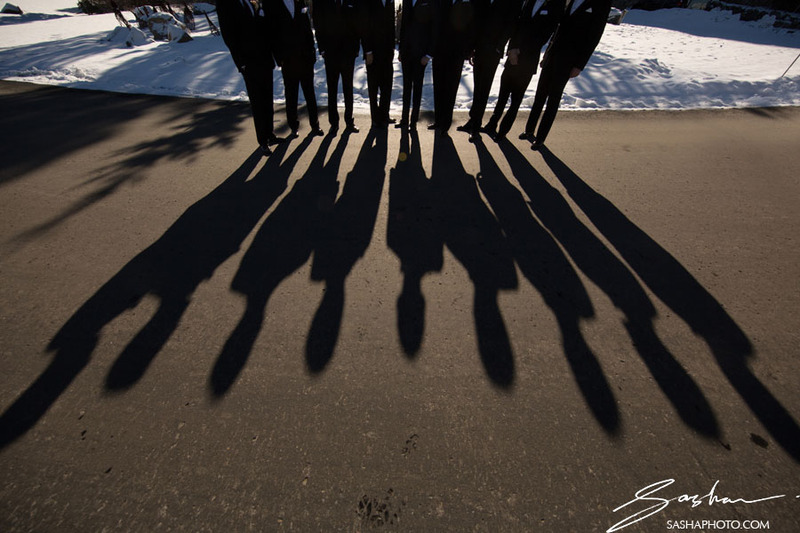 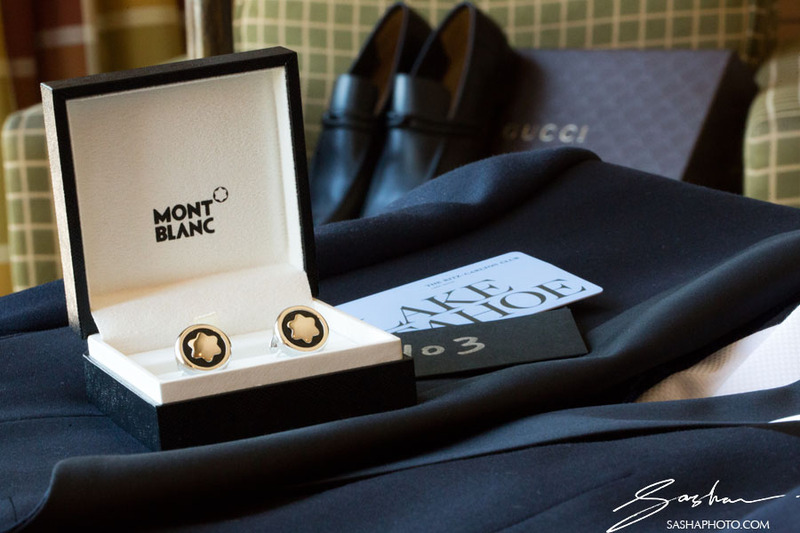 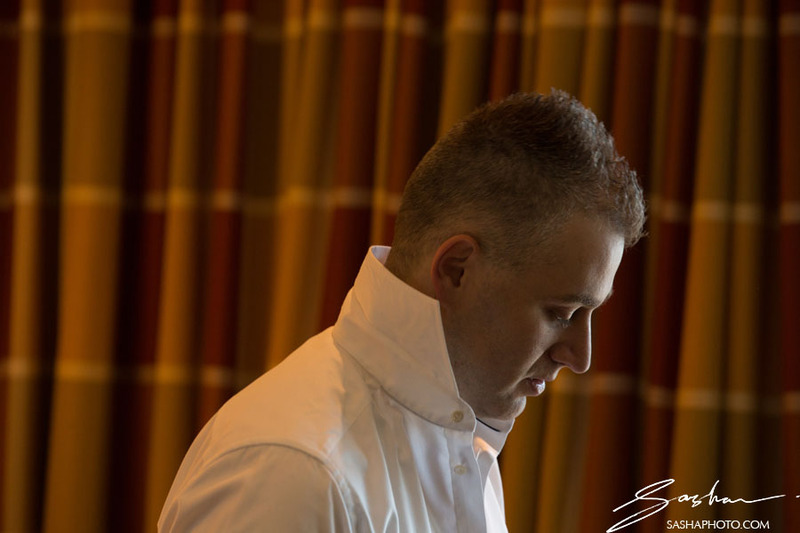 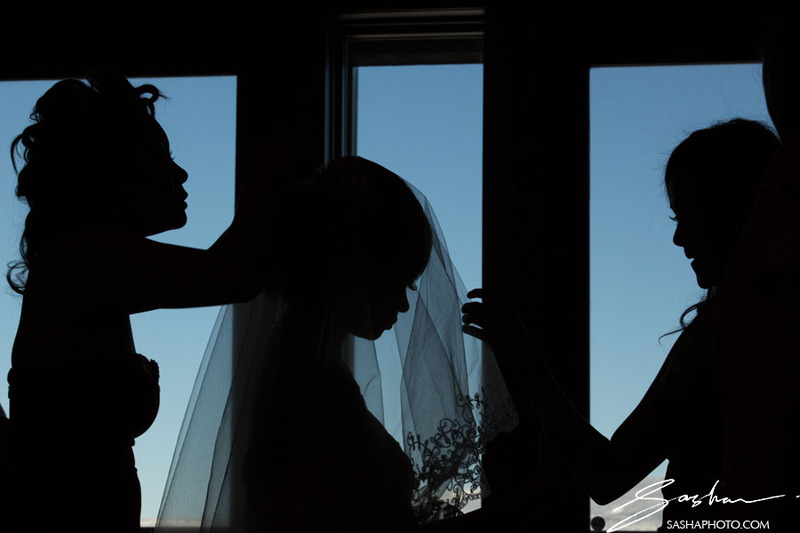 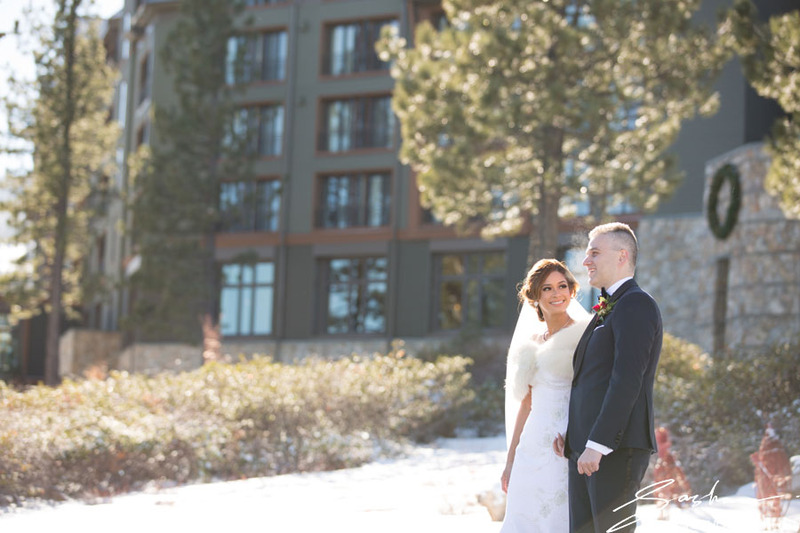 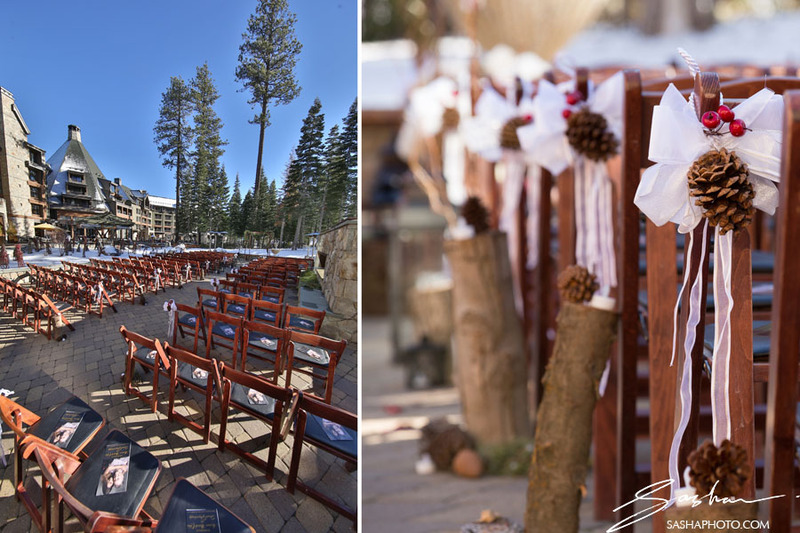 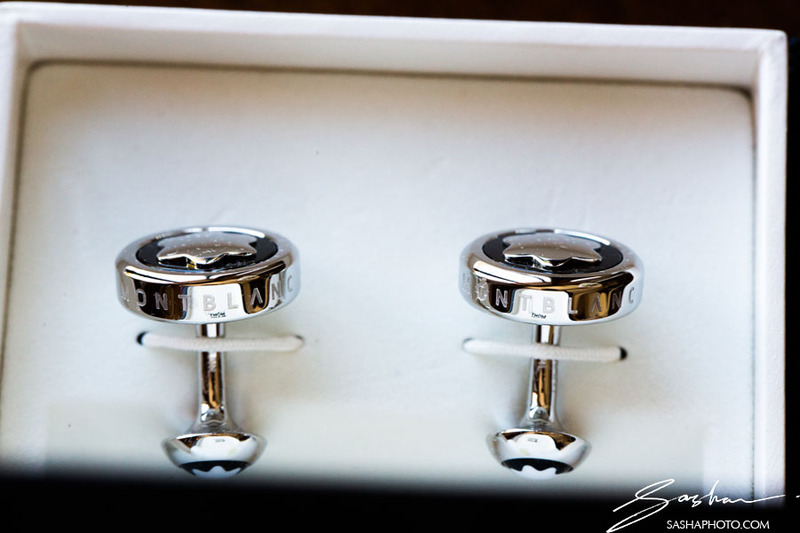 Putting together a Ritz Carlton Lake Tahoe wedding was not an easy undertaking. 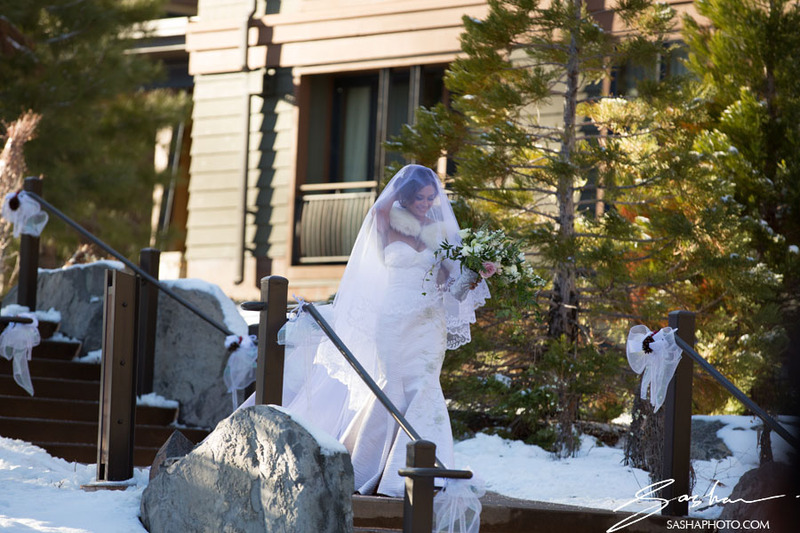 Fortunately Michelle is a capable event planner in her own right. 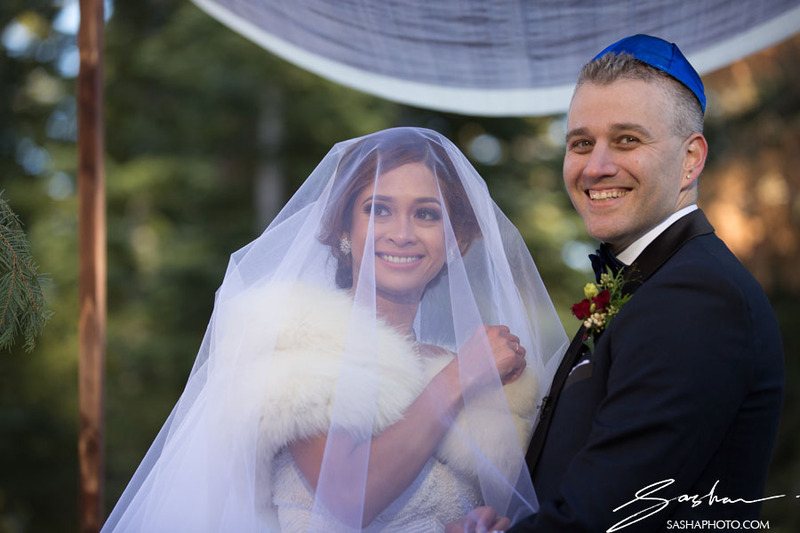 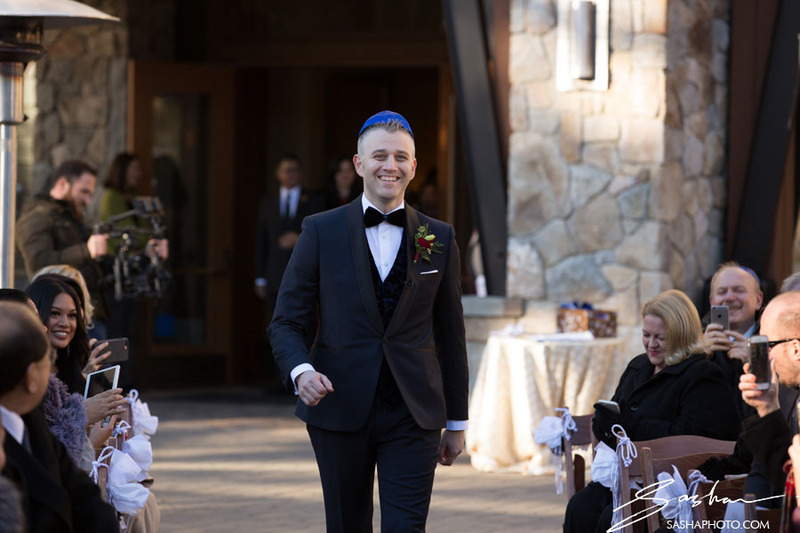 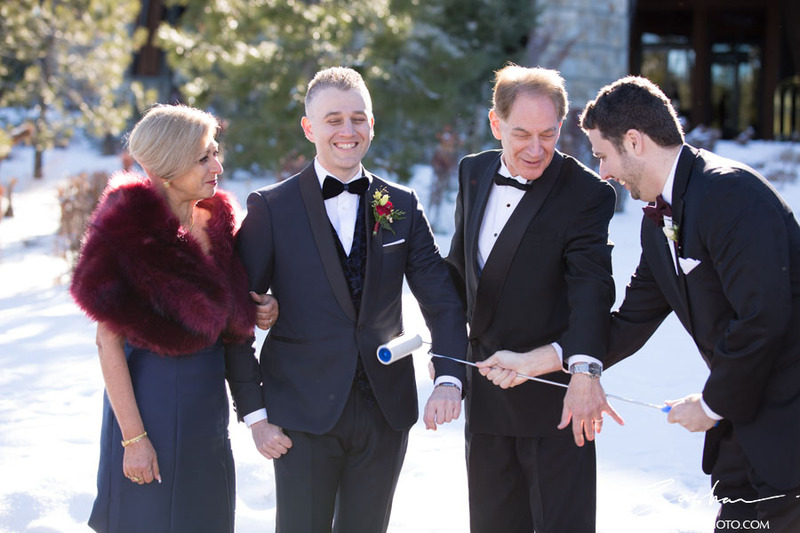 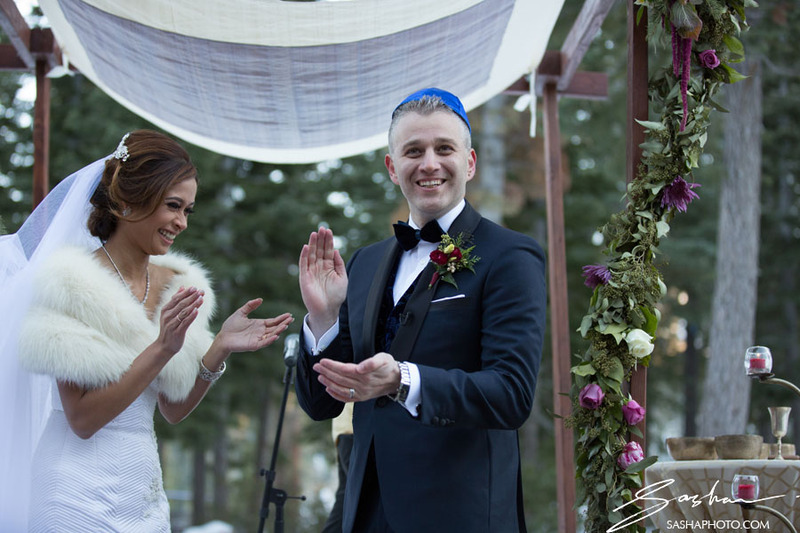 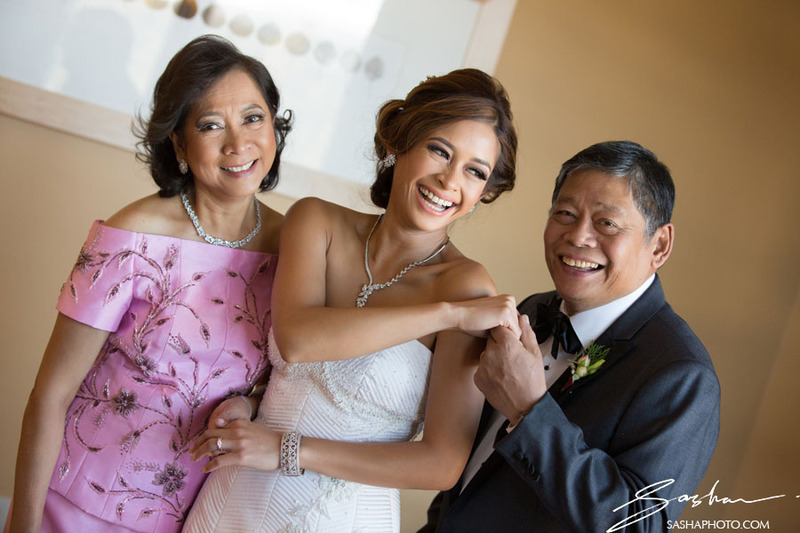 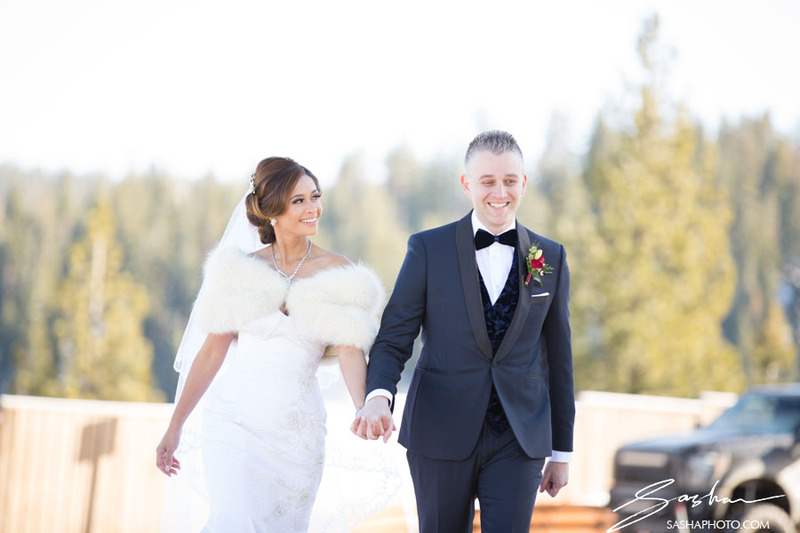 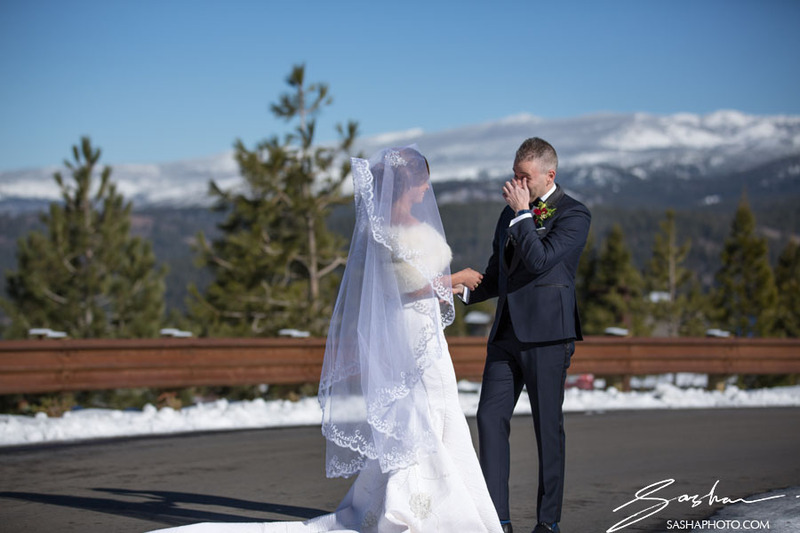 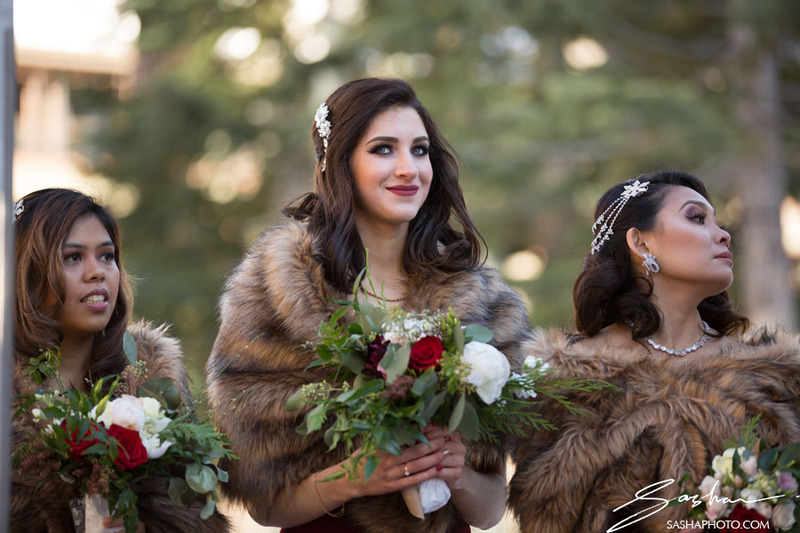 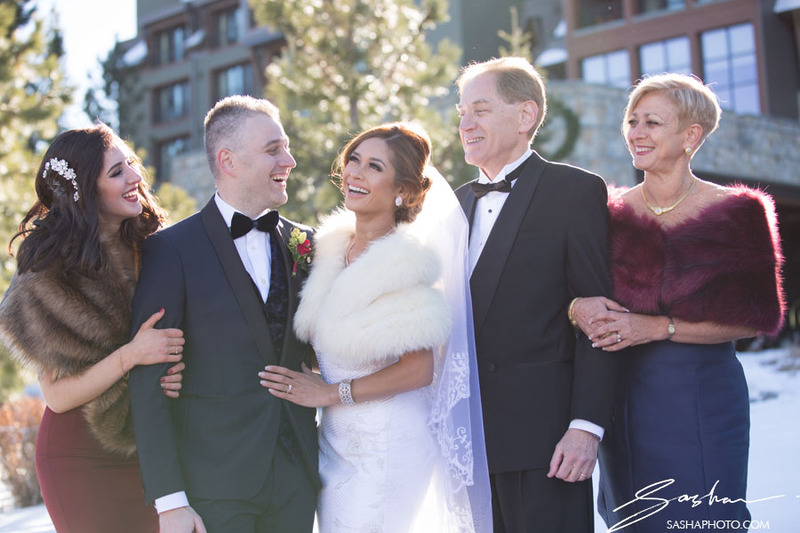 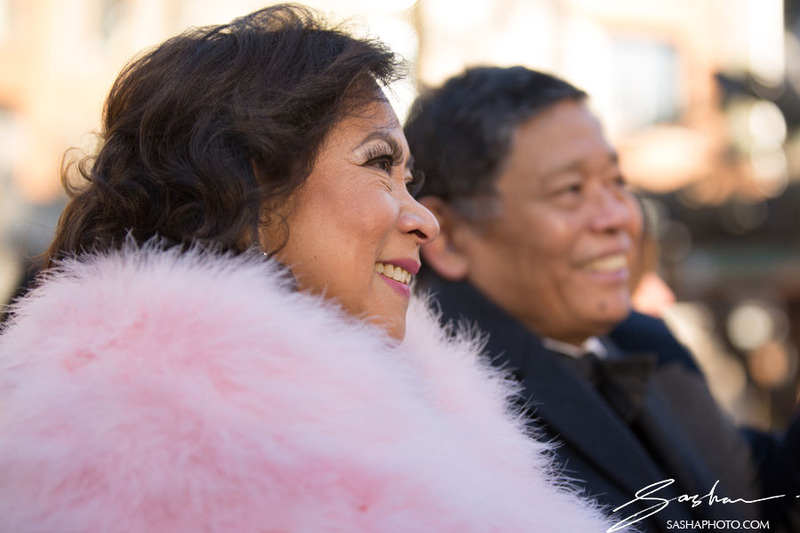 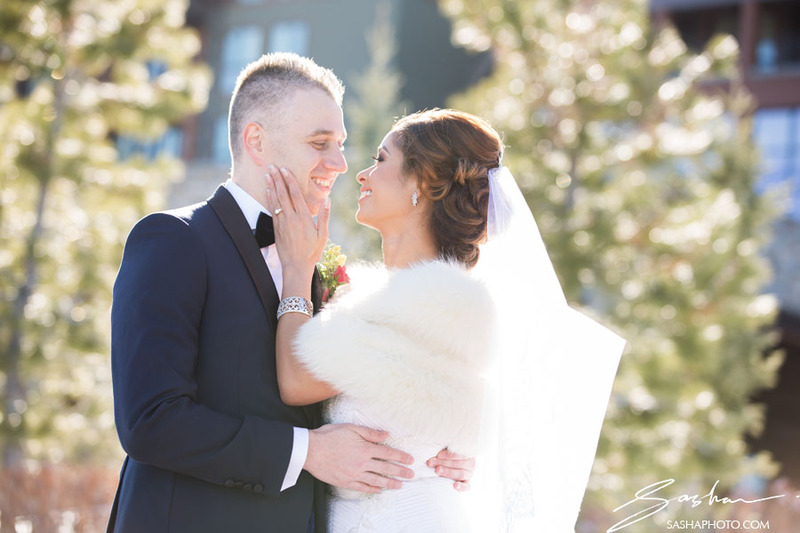 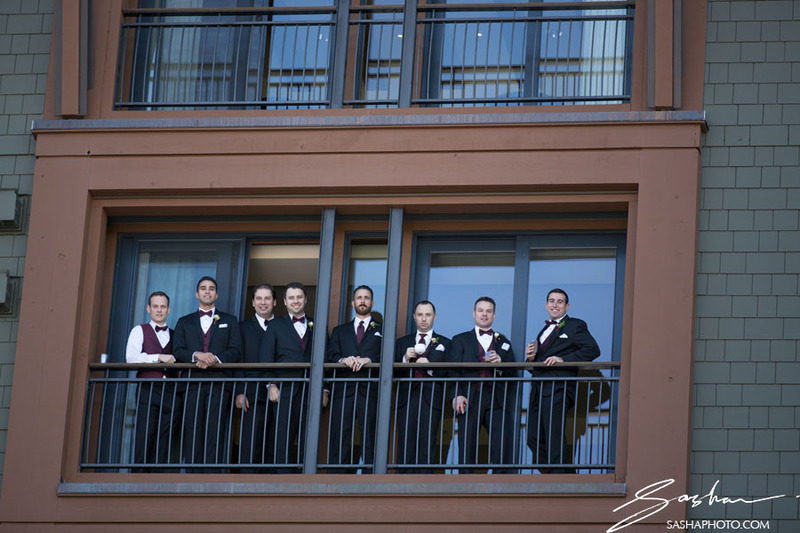 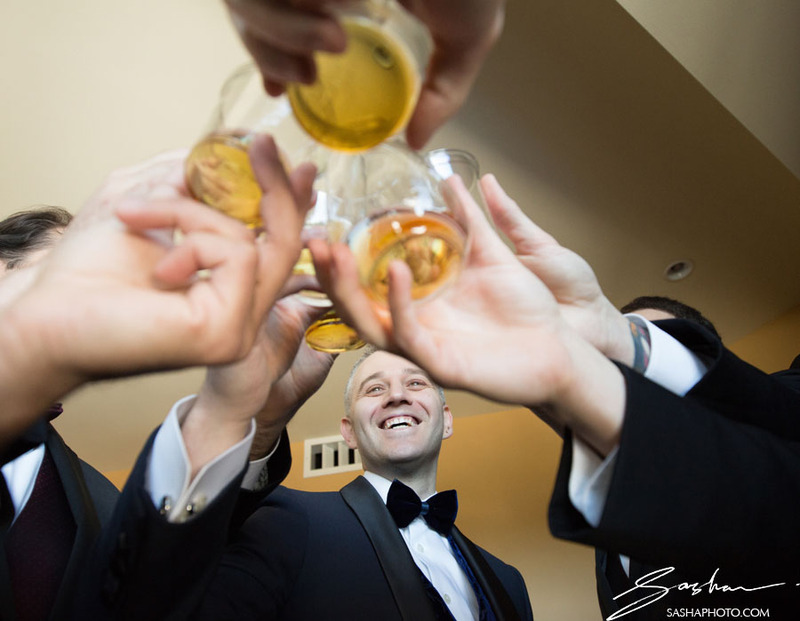 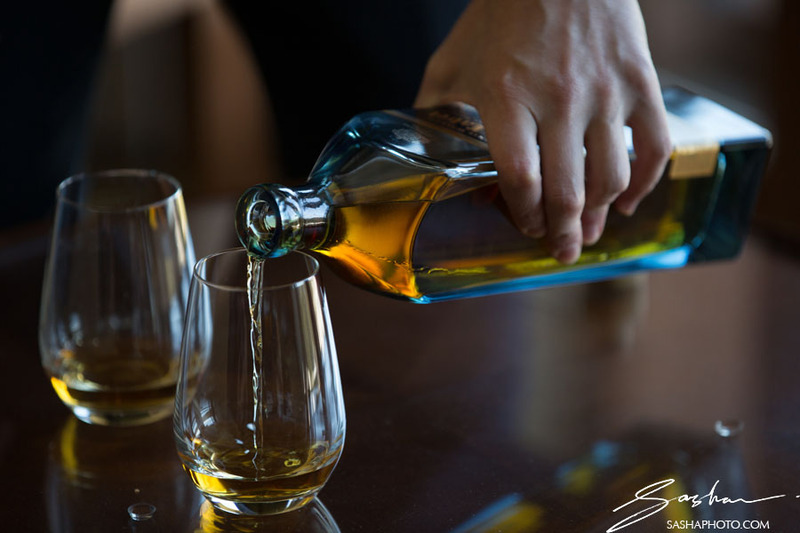 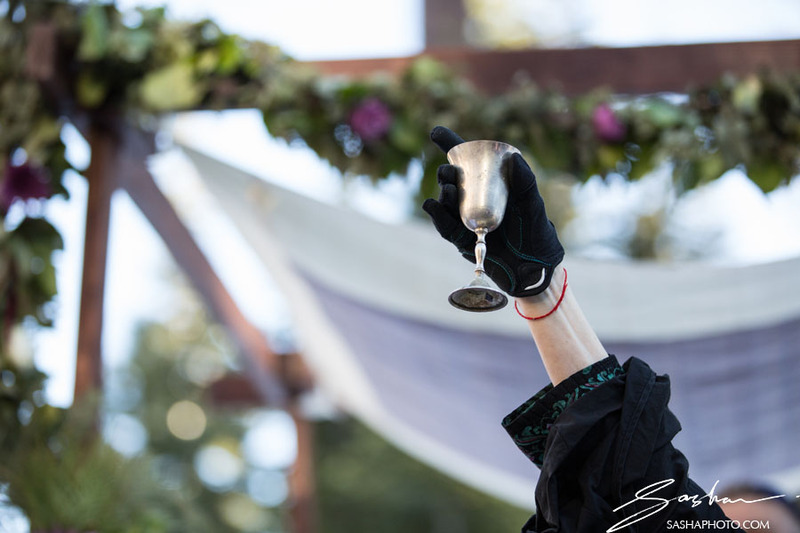 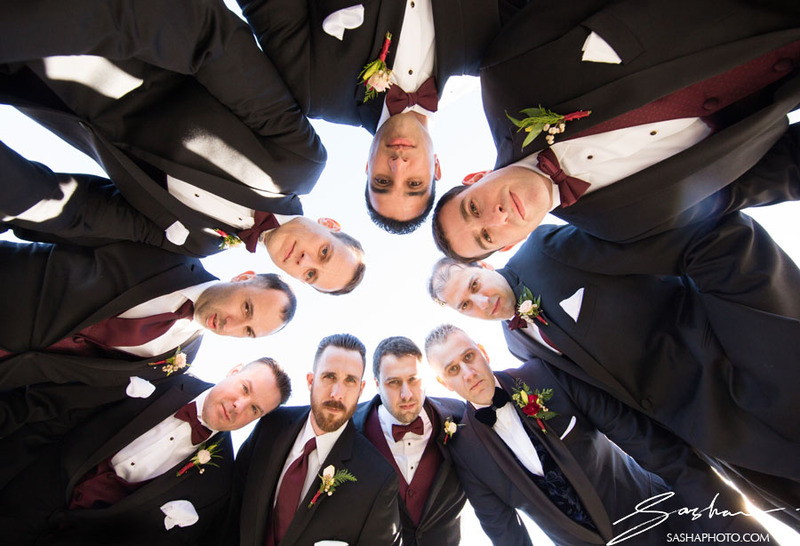 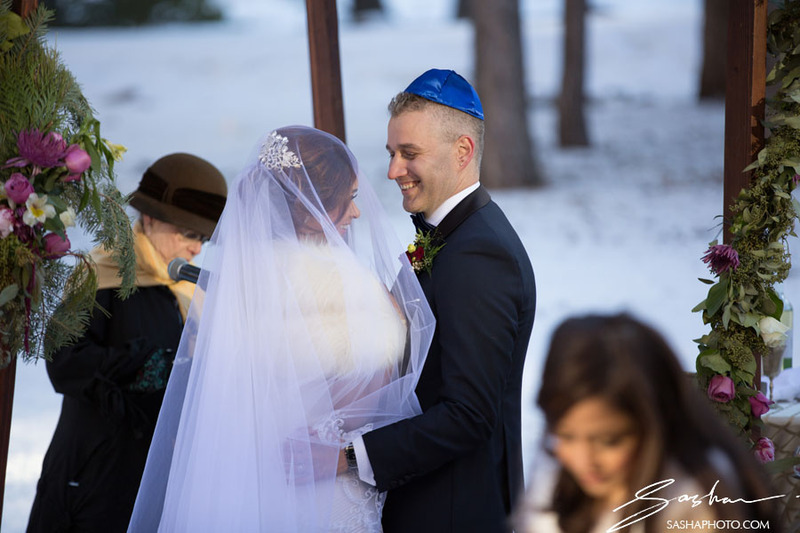 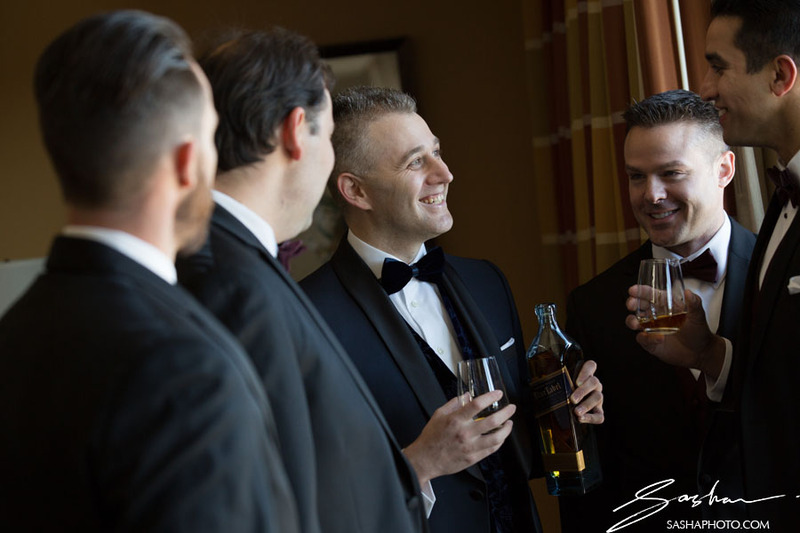 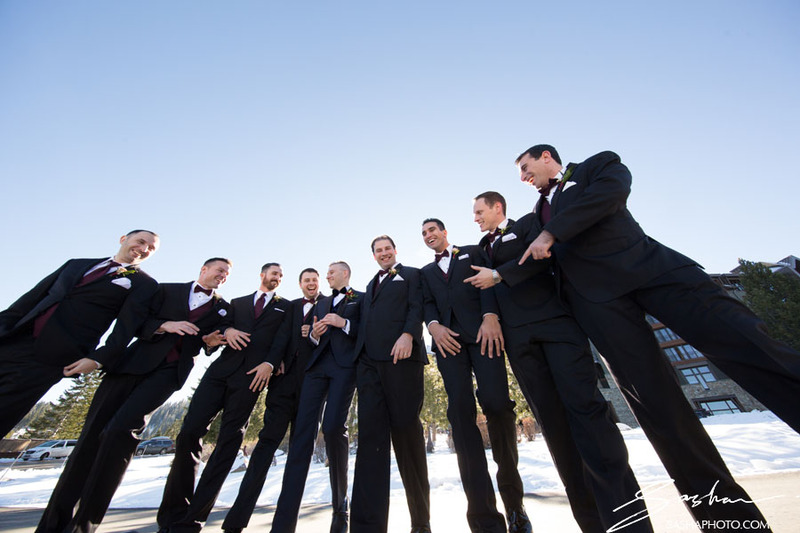 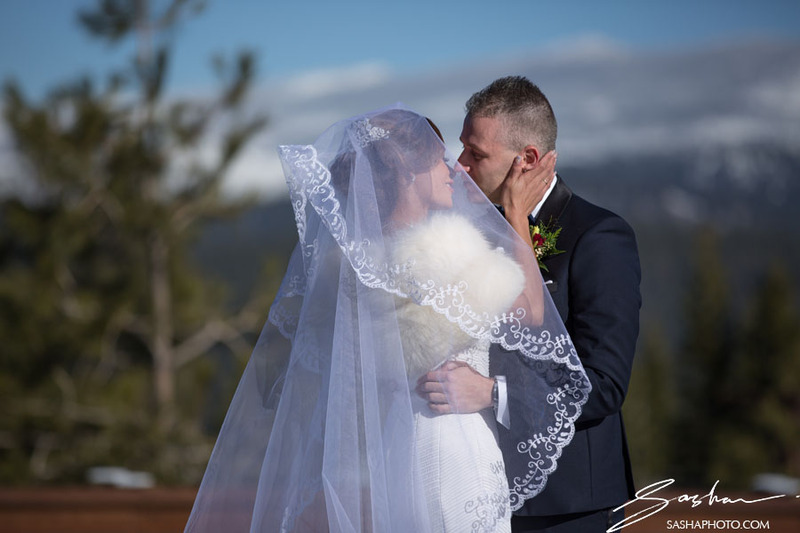 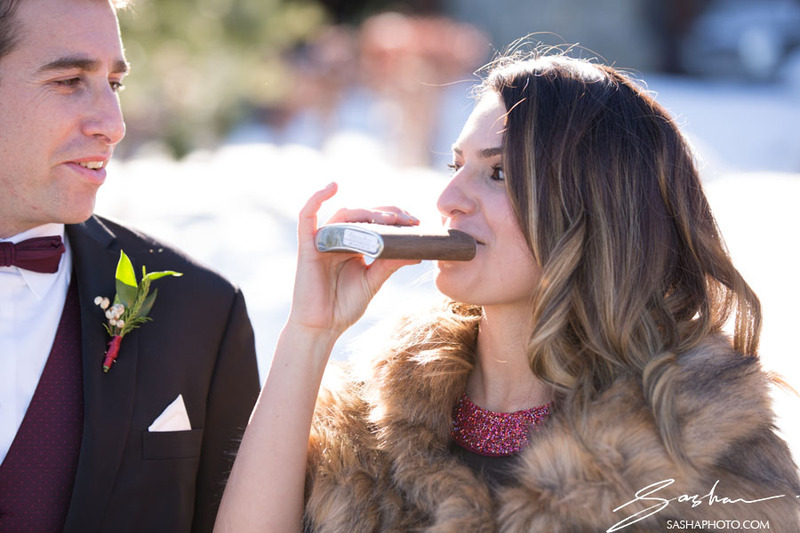 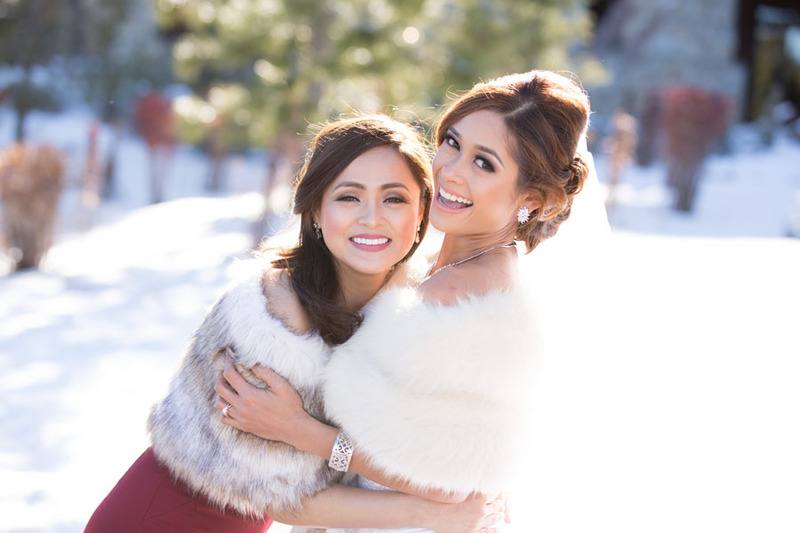 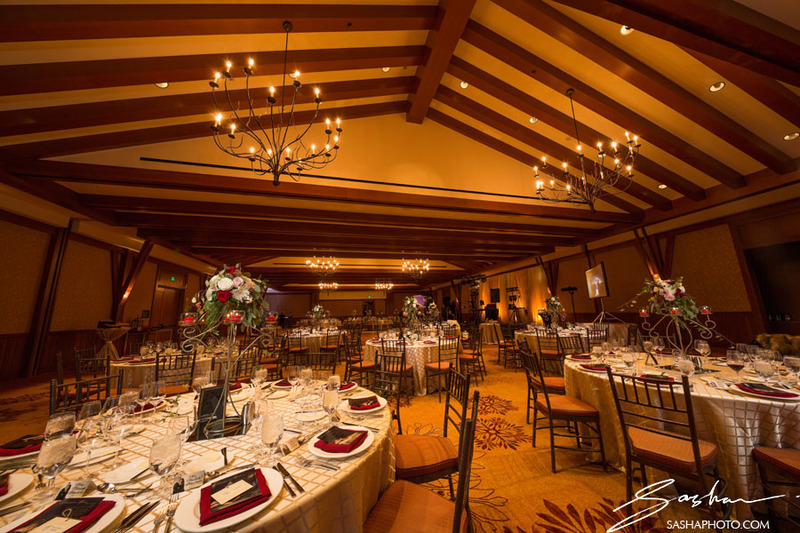 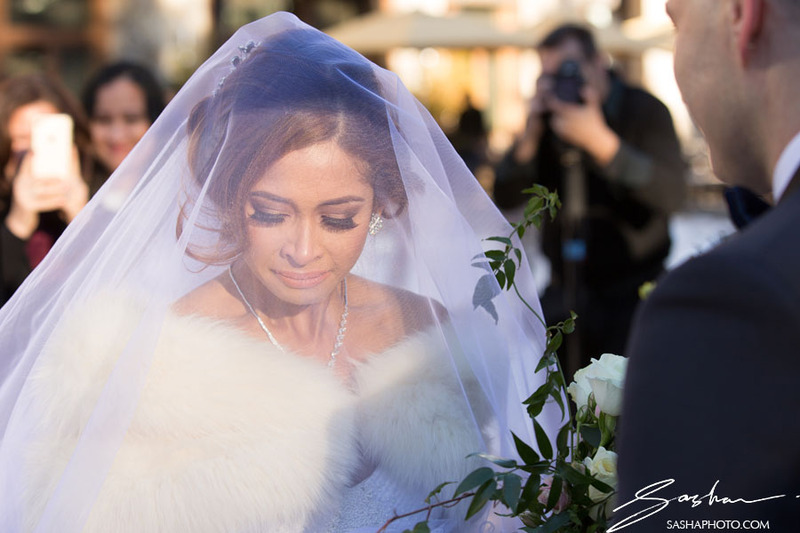 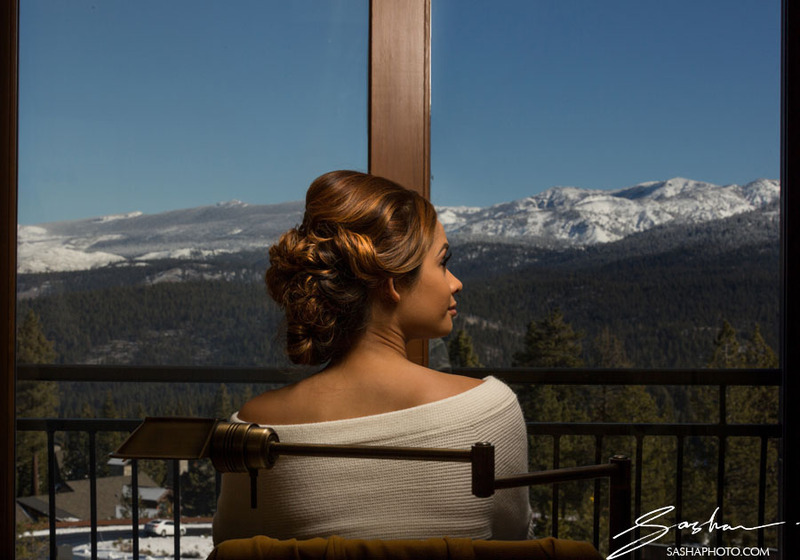 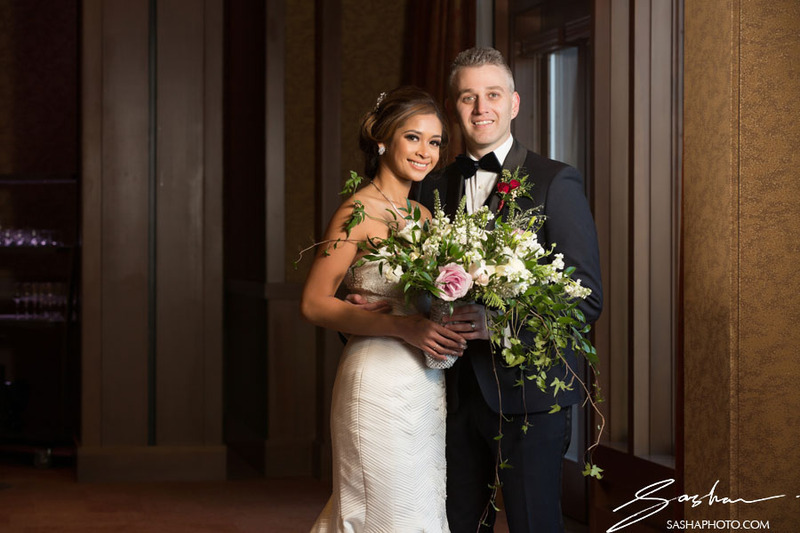 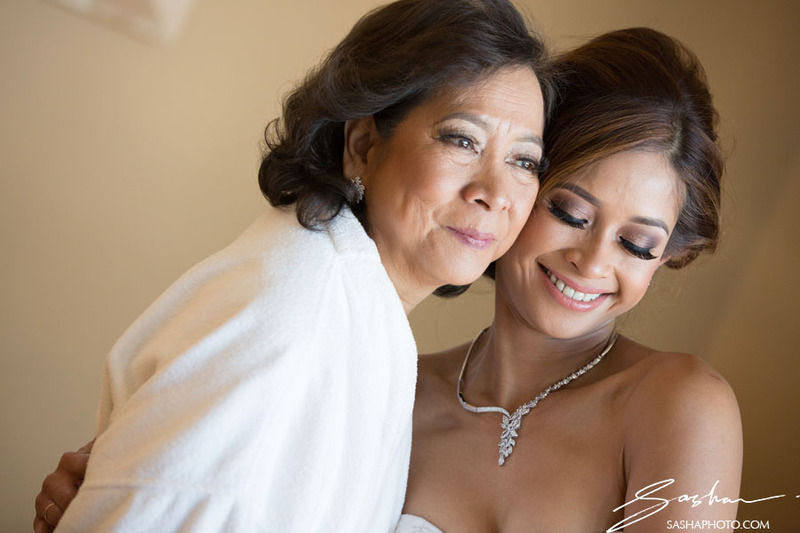 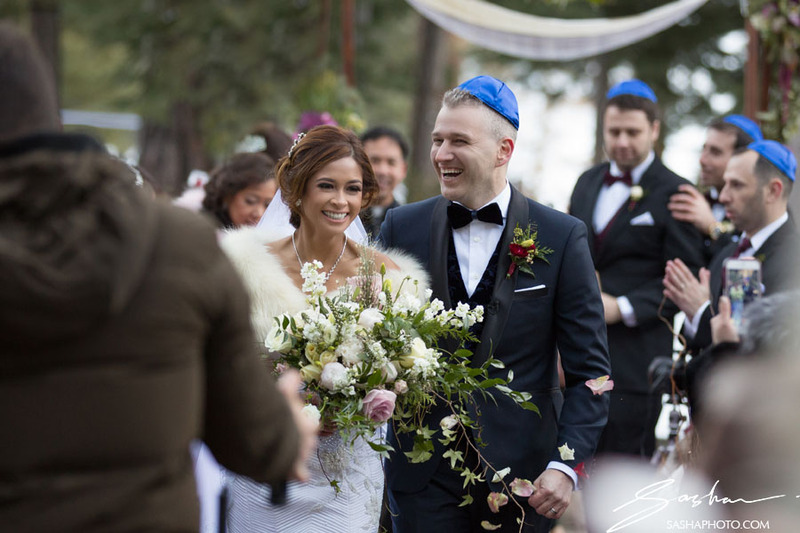 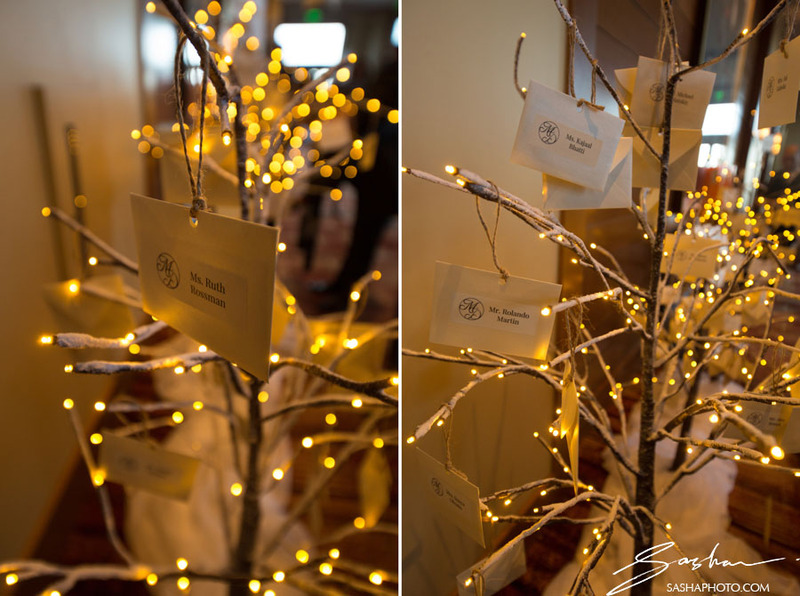 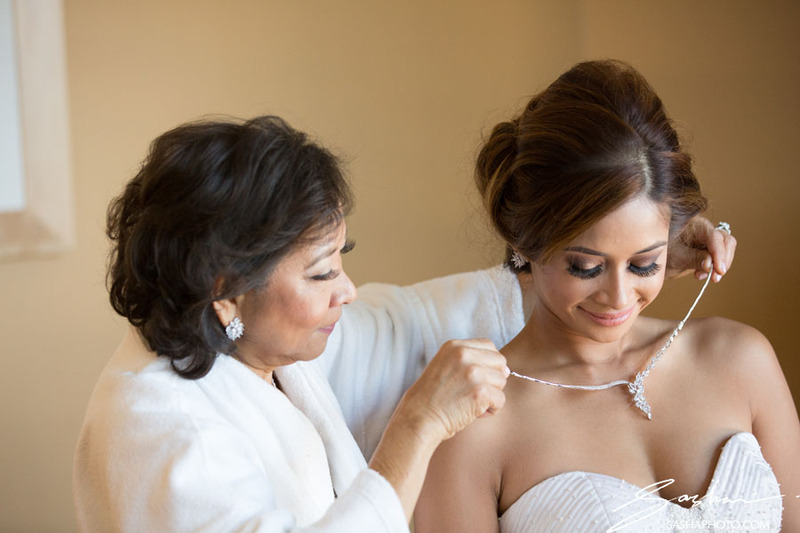 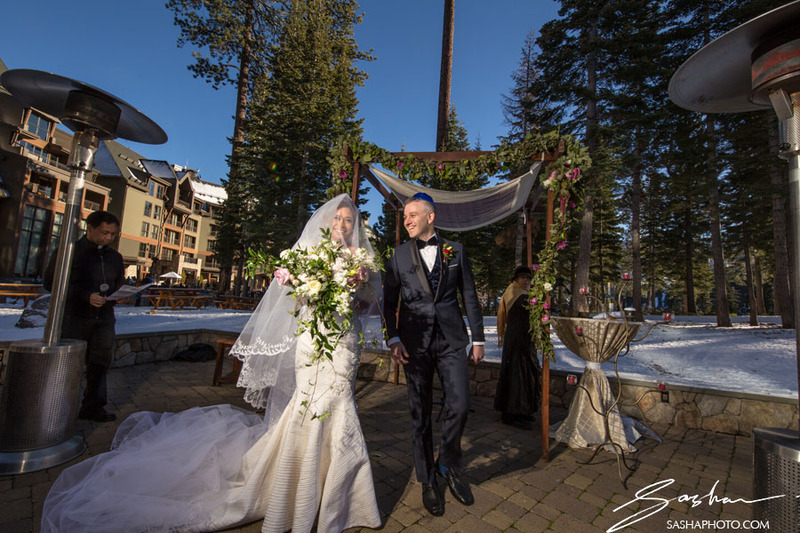 Moreover, the couple has an amazing community of family and friends, many of whom lent a hand to make this Ritz Carlton Lake Tahoe wedding a reality. 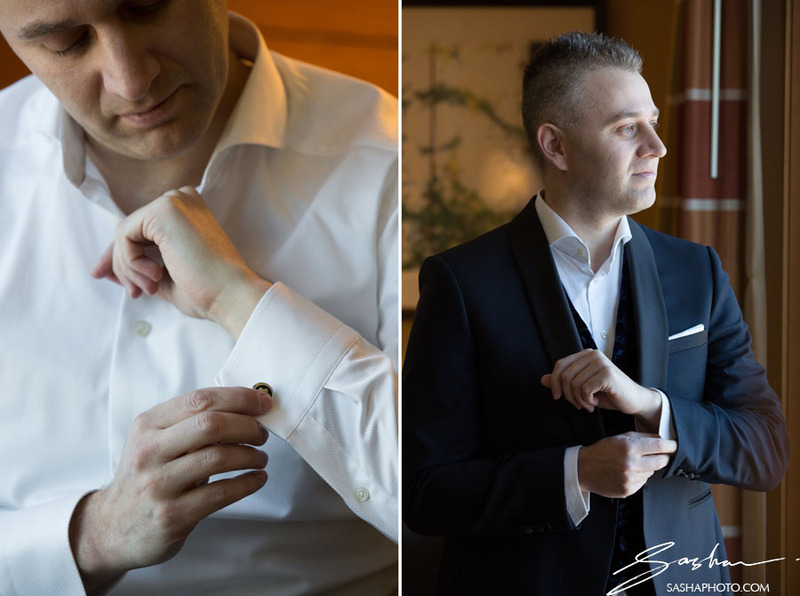 The day began with Dan and Michelle getting ready in their suites. 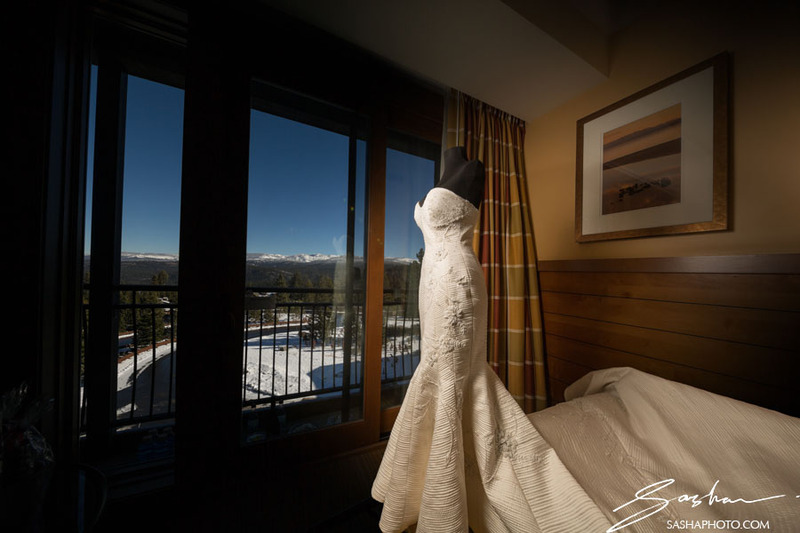 Each room had a gorgeous view of the snow-capped mountains. 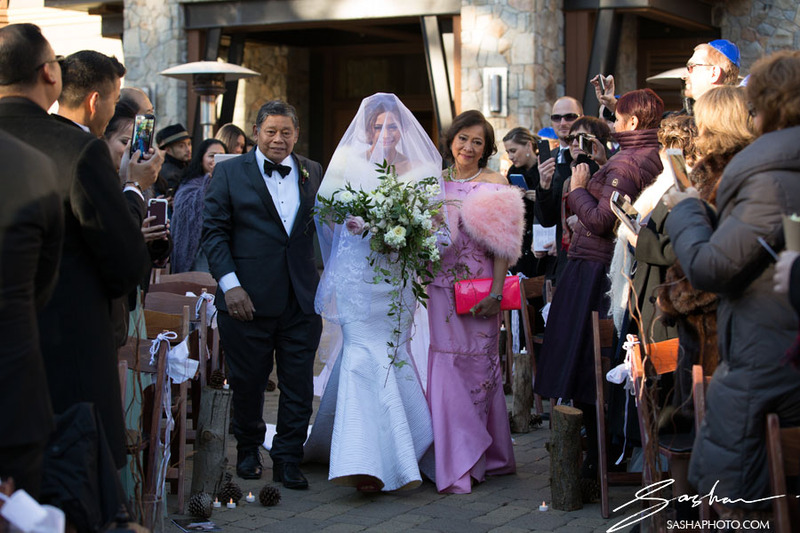 Michelle put on her custom-made dress (it was made of a special quilted material that kept her warm) and made her way down to Dan for the first look. 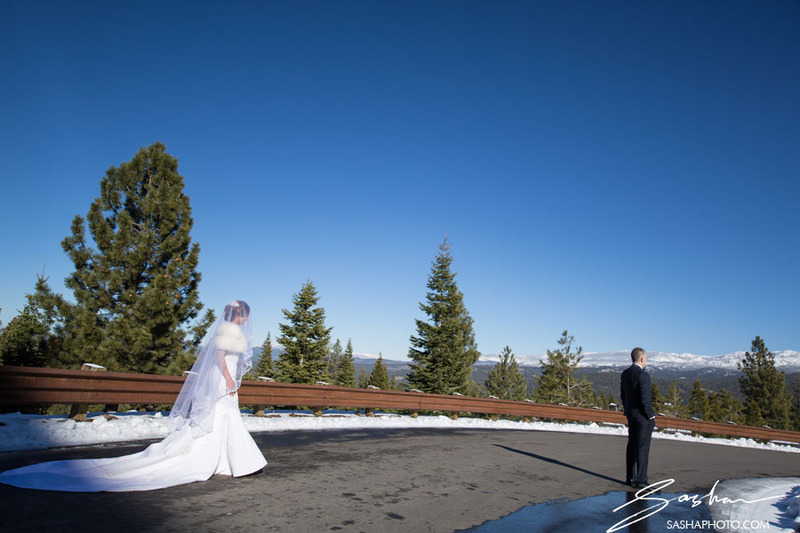 Alex of IQVideography guided her down over the precarious terrain. 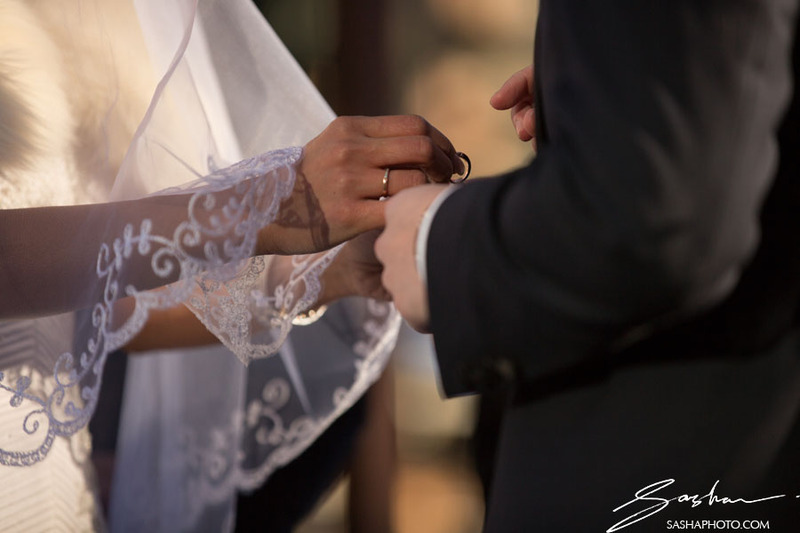 (He also created an incredible love story film which screened at the reception.) 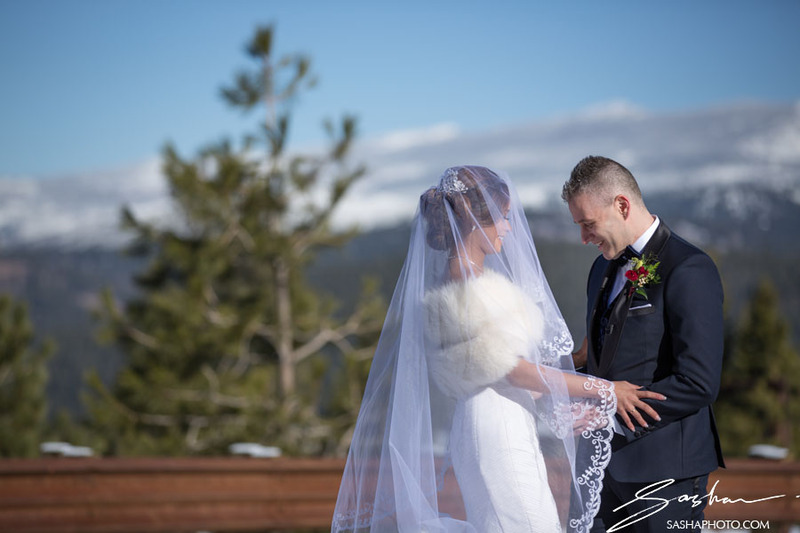 The sun was out, and as a result, the day was crips and gorgeous. 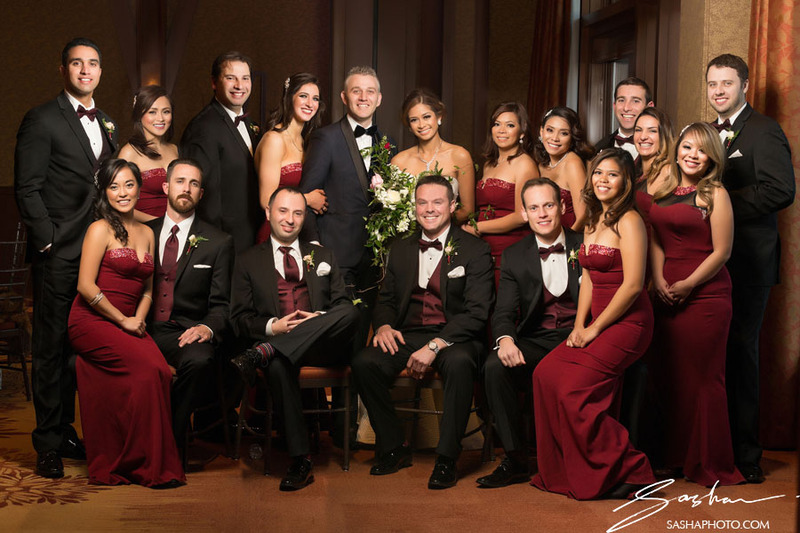 We took full advantage did an extensive photoshoot with the couple and wedding party. 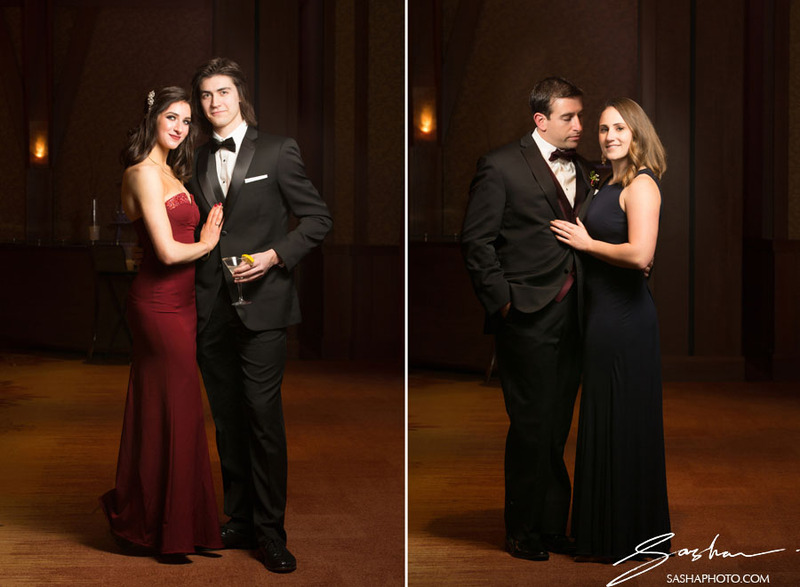 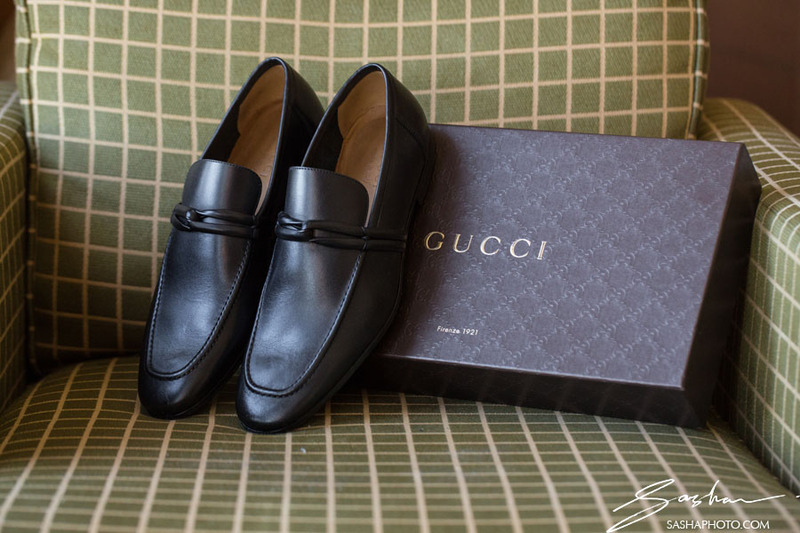 This was a black-tie affair and everyone was looking gorgeous. 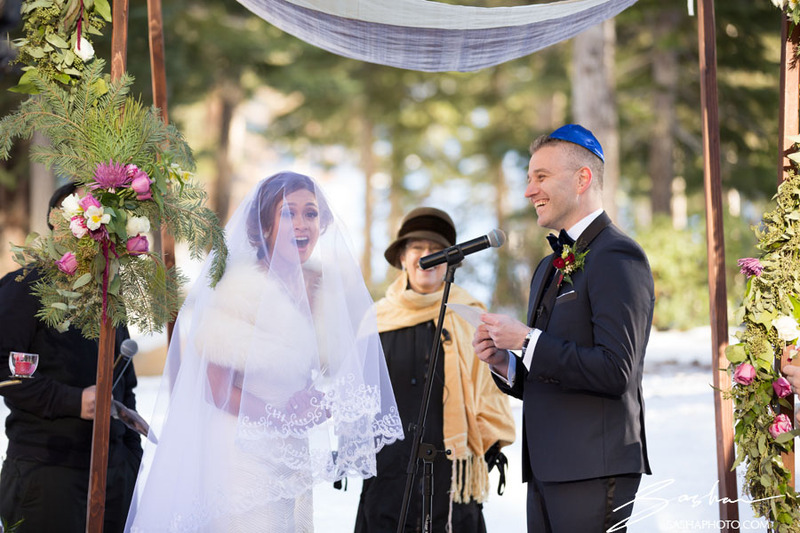 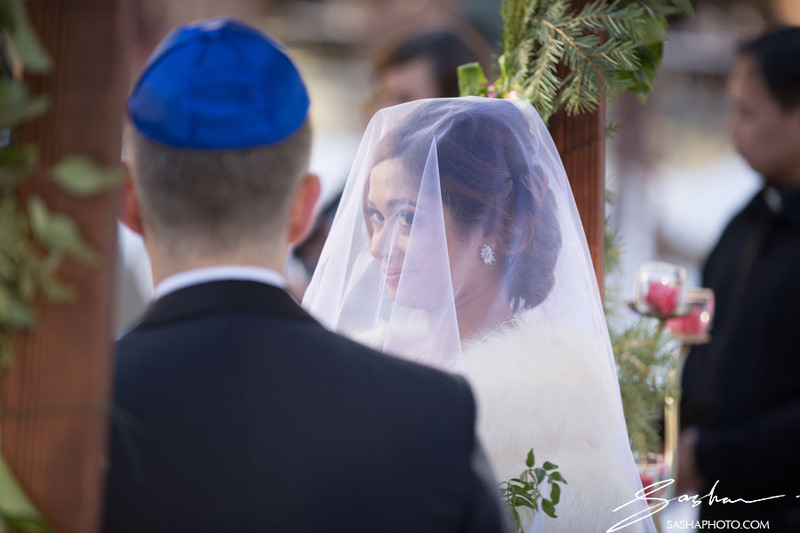 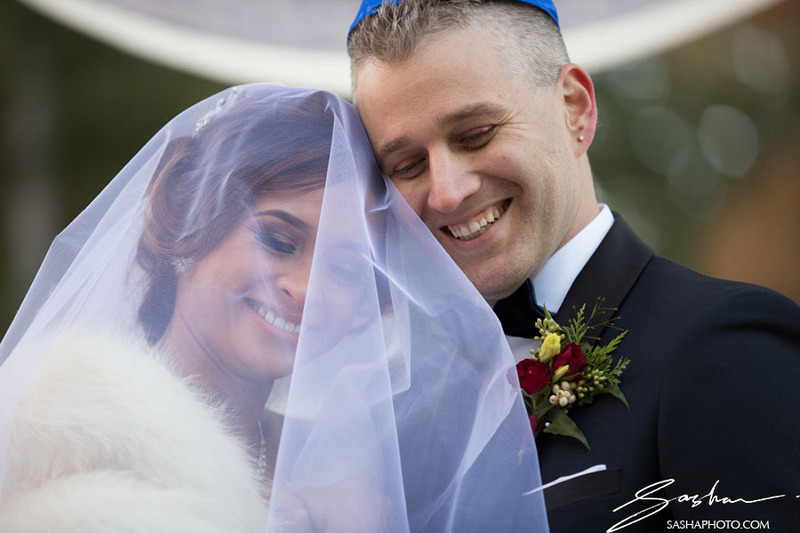 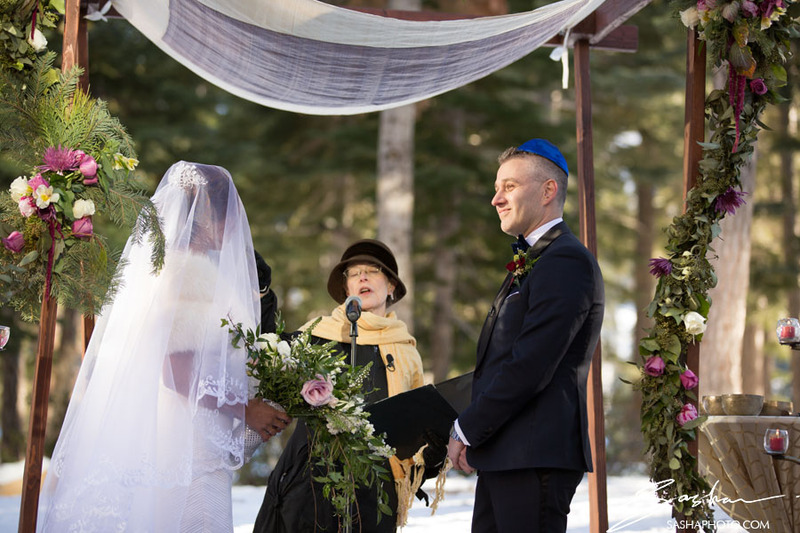 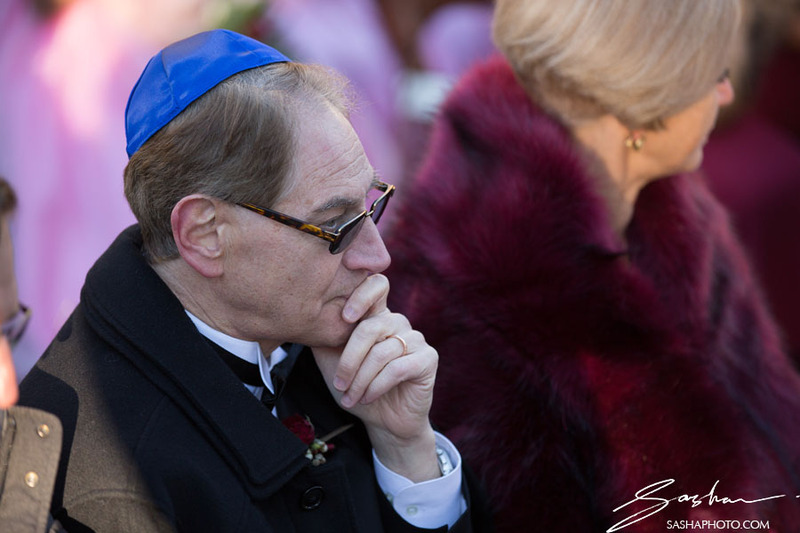 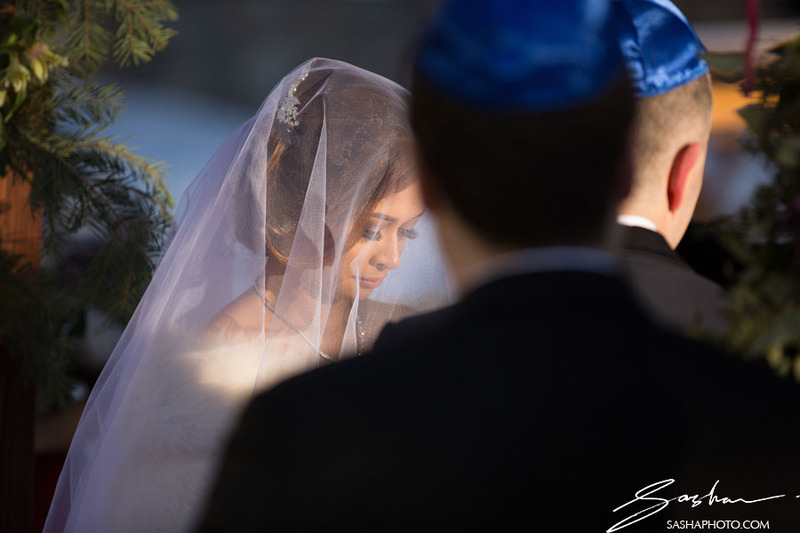 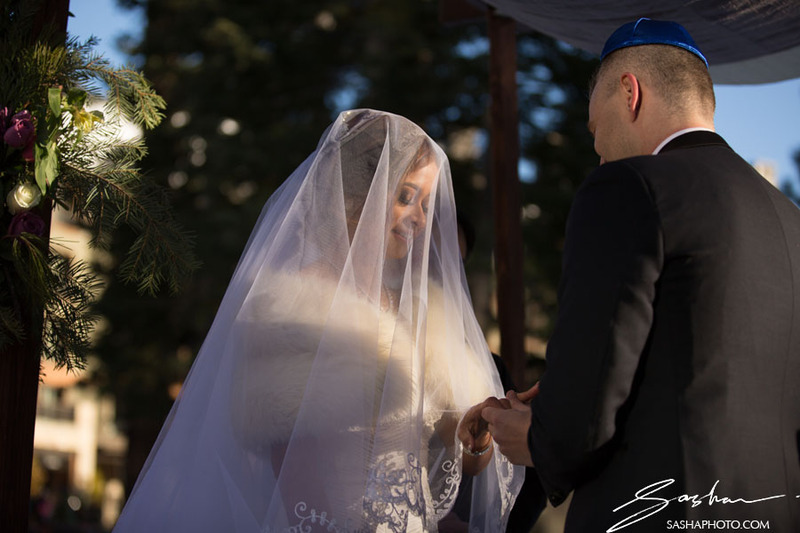 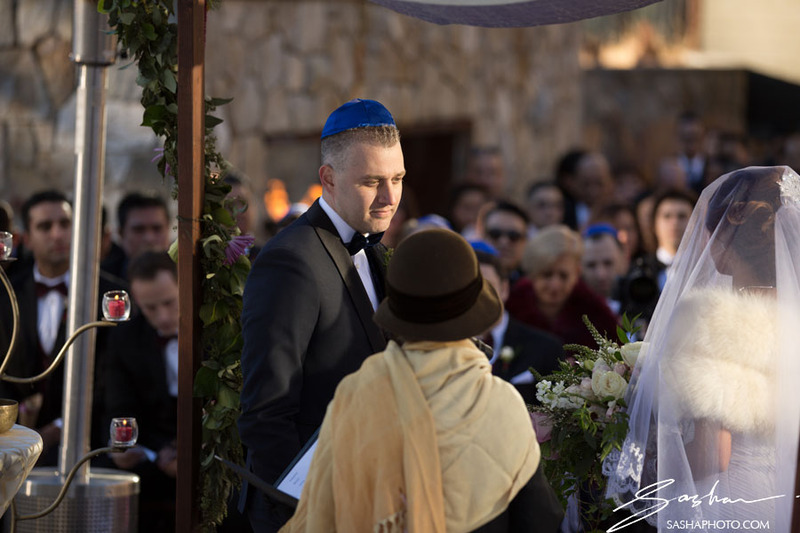 The wedding incorporated both Catholic and Jewish traditions, and so there was a ketubah signing and a creatively blended ceremony. 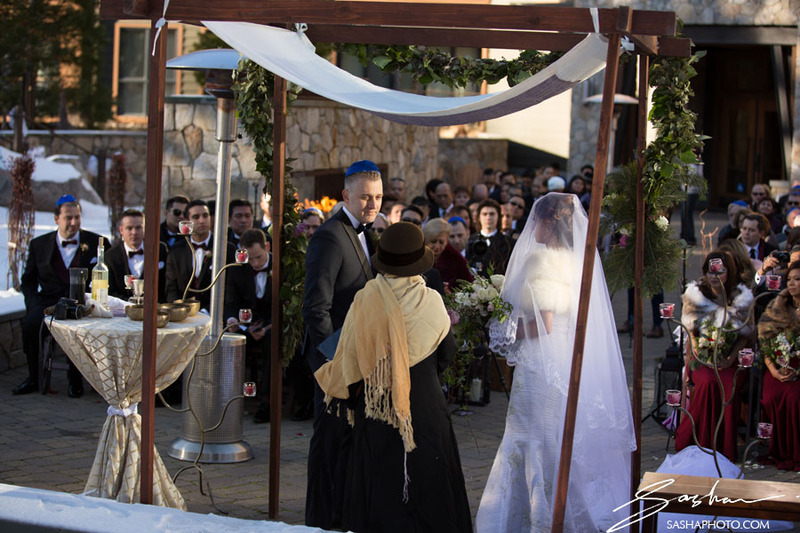 As Rabbi Sara Shendelman and Father Mark officiated, Dan and Michelle were beaming and glowing under the chuppah the entire time. 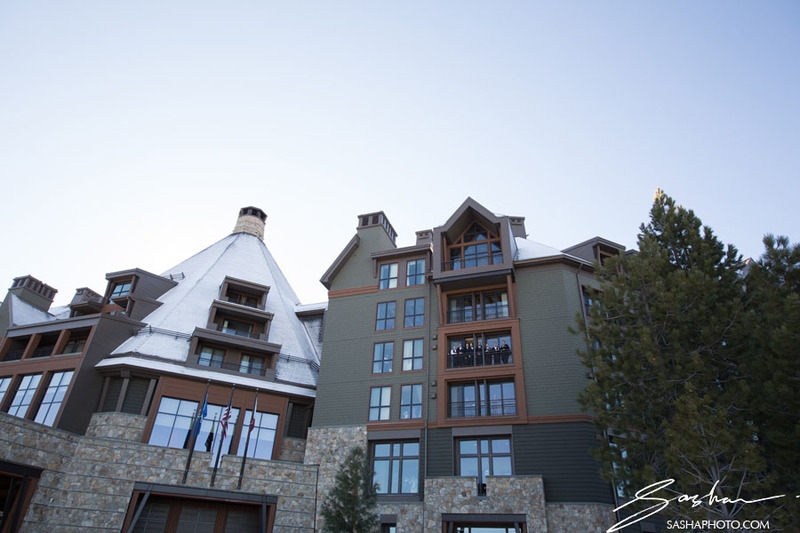 At some point the sun fell behind the buildings, and the temperature dropped quickly. 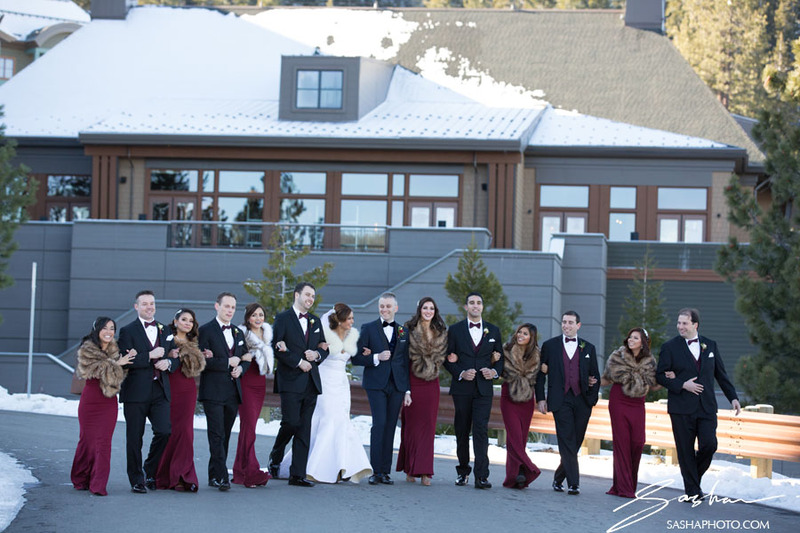 Bride, groom and guests huddled closer for warmth. 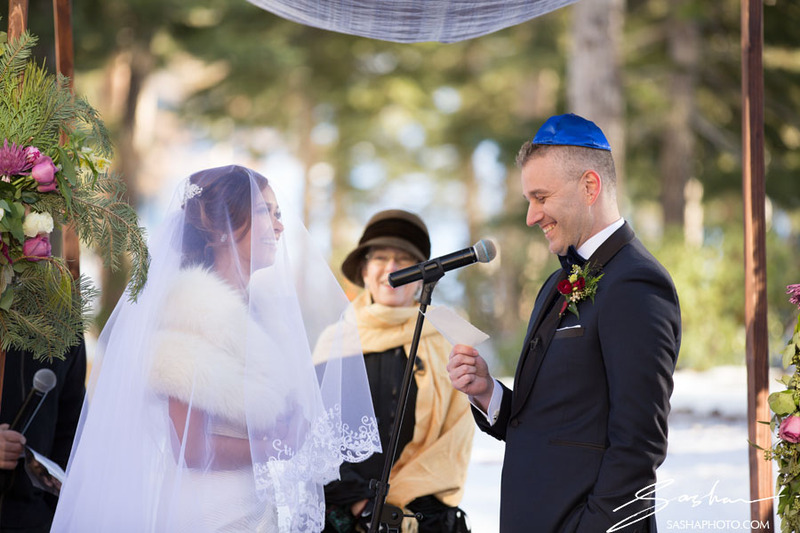 After the first kiss and the breaking of the glass, everyone was more than ready to get inside, get warm, and with the help of Nara and her Band, party the night away! 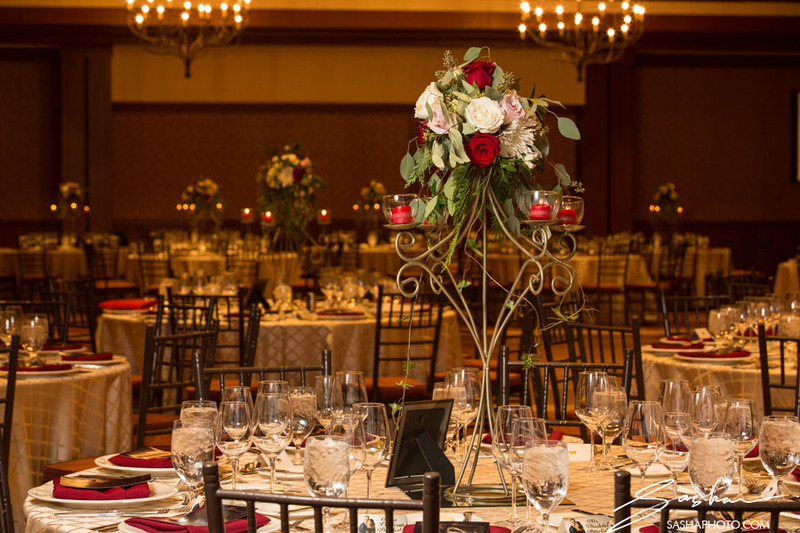 Florals provided by Love & Lupines. 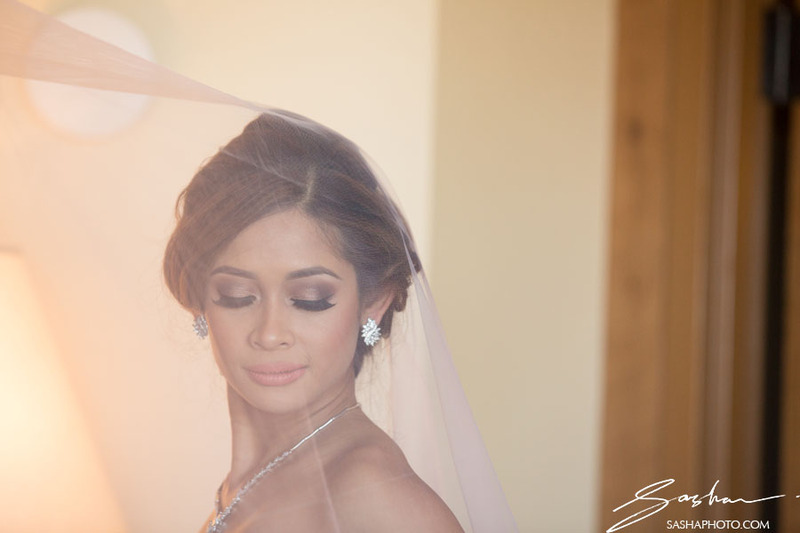 Makeup by Jessica Frese. 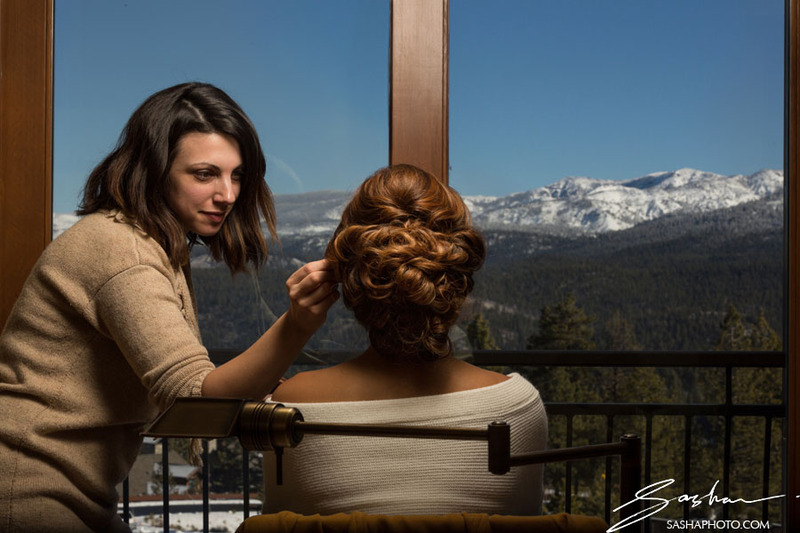 Hair by Love is in the Hair. 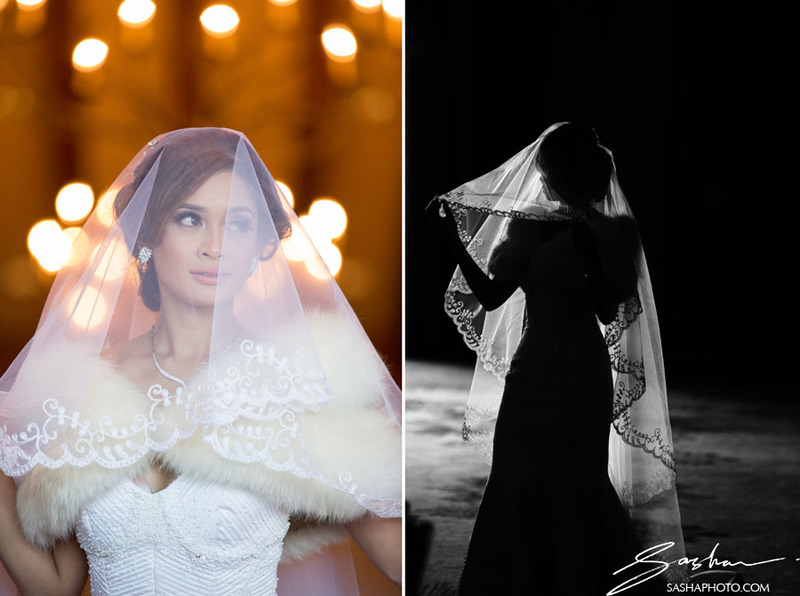 Dress designer Edgar Madamba. 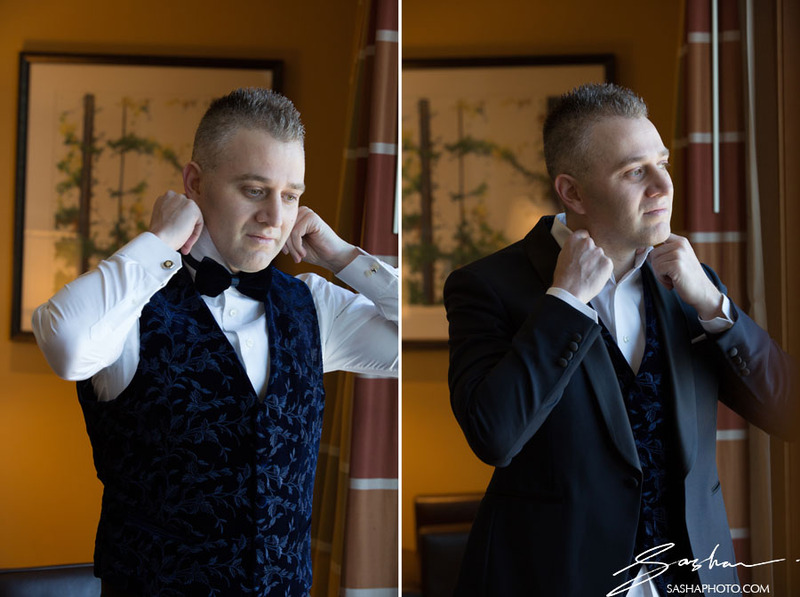 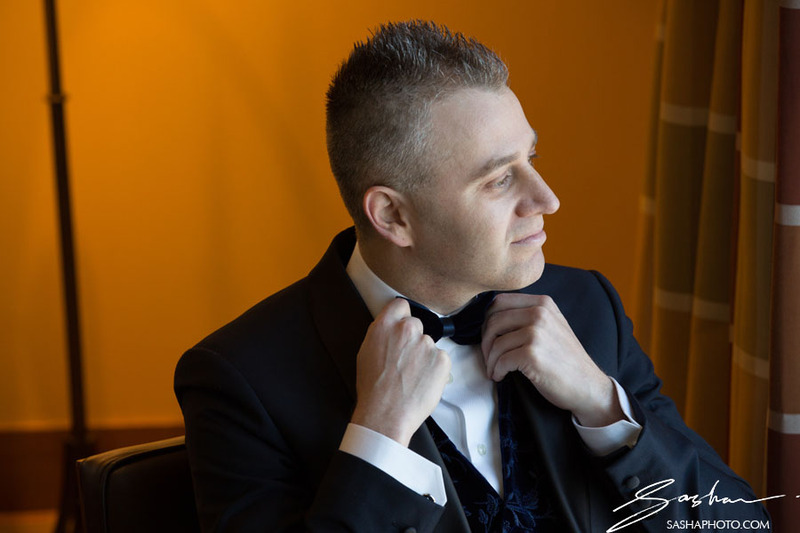 Groom’s tuxedo by David Yahid of Couture Ouomo. 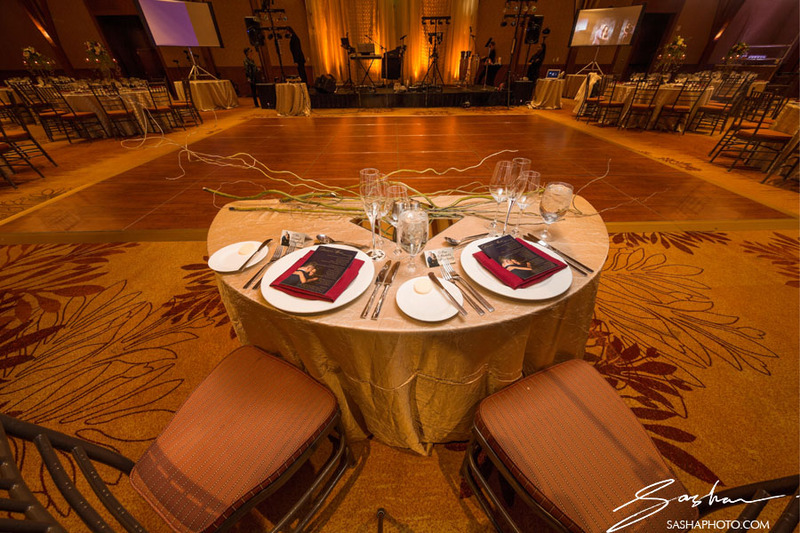 Event design by Monet Florendo.